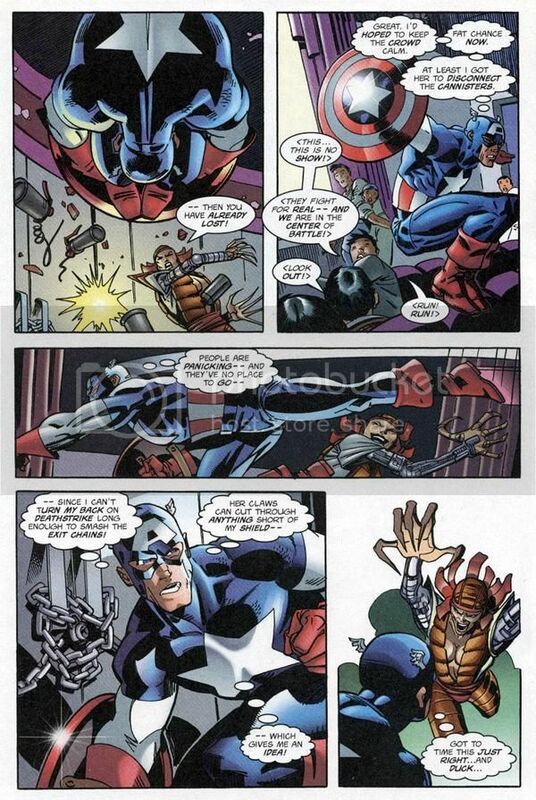 Captain America doesn’t age normally being that he was stuck in Dimension Z fighting for survival for 12 years and has barely aged. 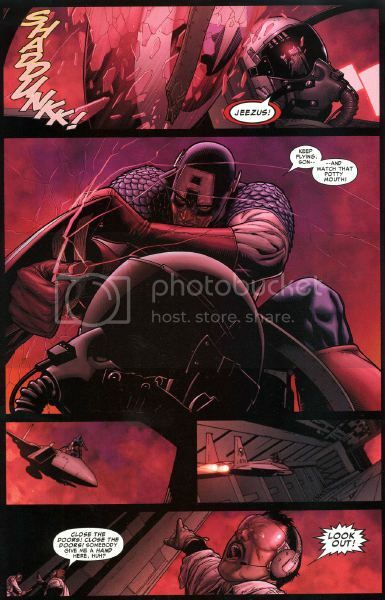 Captain America throws the shield with enough strength and momentum to KO an enraged Namor. 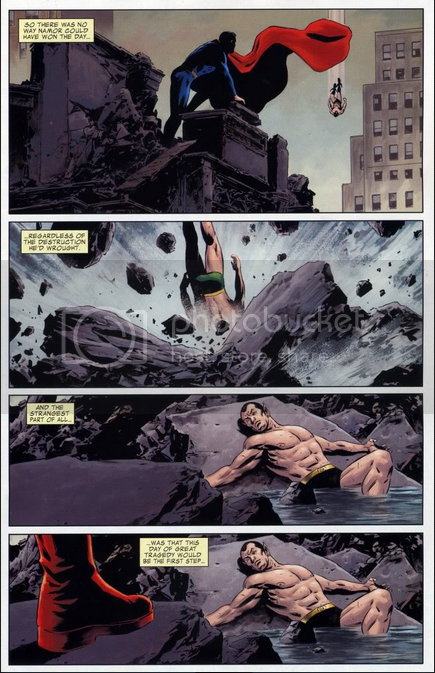 In fairness, it was most likely a lucky shot (Namor’s a 100+ tonner), but still impressive nonetheless. 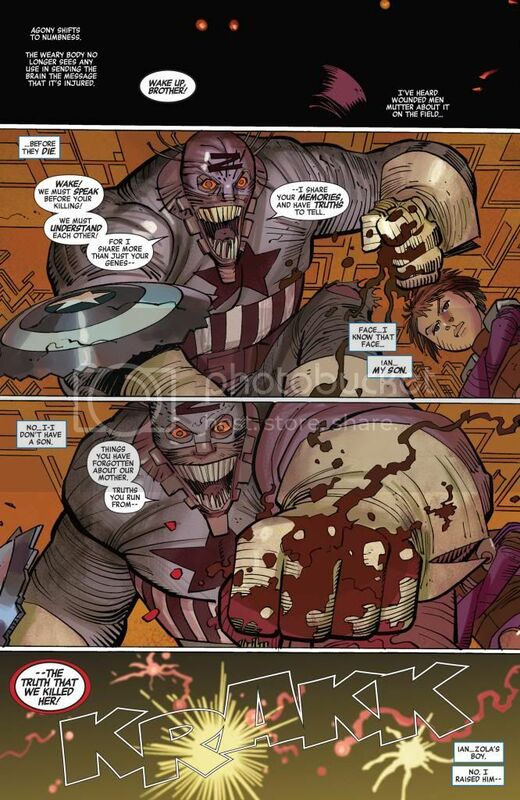 Captain America disguised as crossbones fights through a 4 man gauntlet. One of them Nimrod, having a durability rating of 5 out of 7. 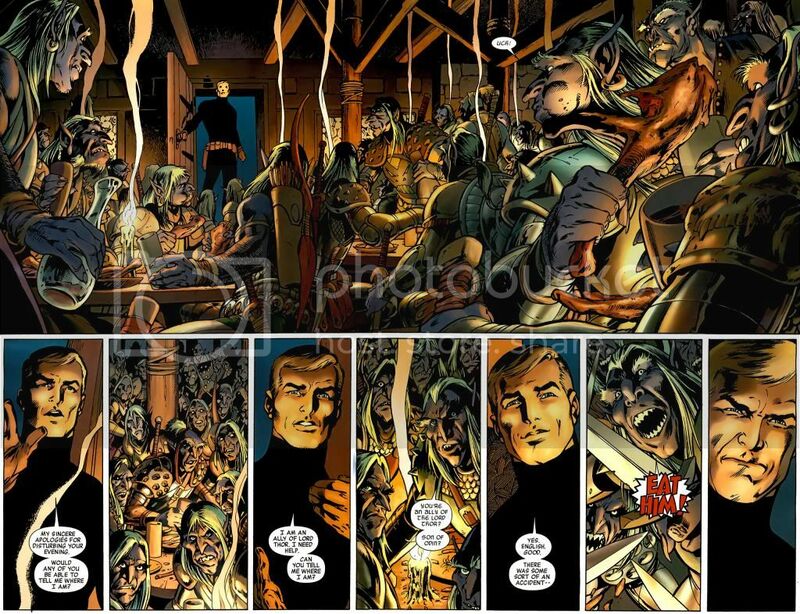 He then continues to fight the group of unarmed villains and gets away. 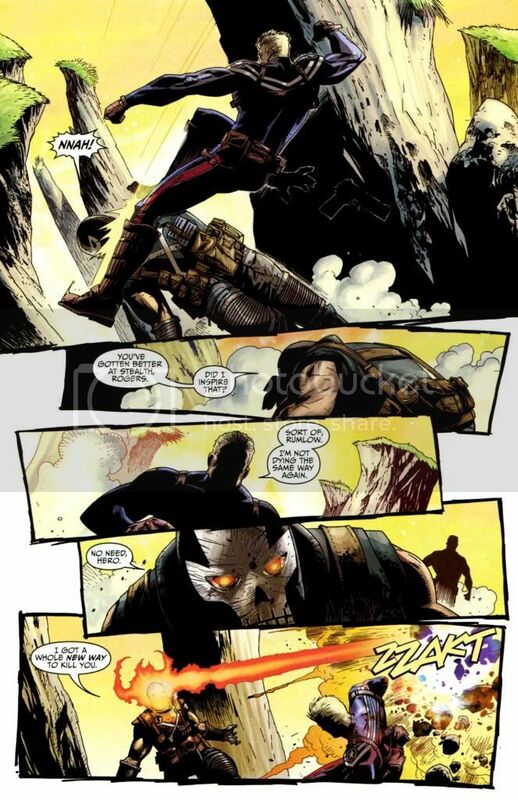 Dodges Crossbones energy attack at point blank range and the other when crossbones is directly above him. Able to dodge lasers from flying opponents while he’s in freefall! Blocks random energy attacks with a metal glove,which shows some great hand speed. Cap trapped in a floor designed to spin with beams coming from all direction. 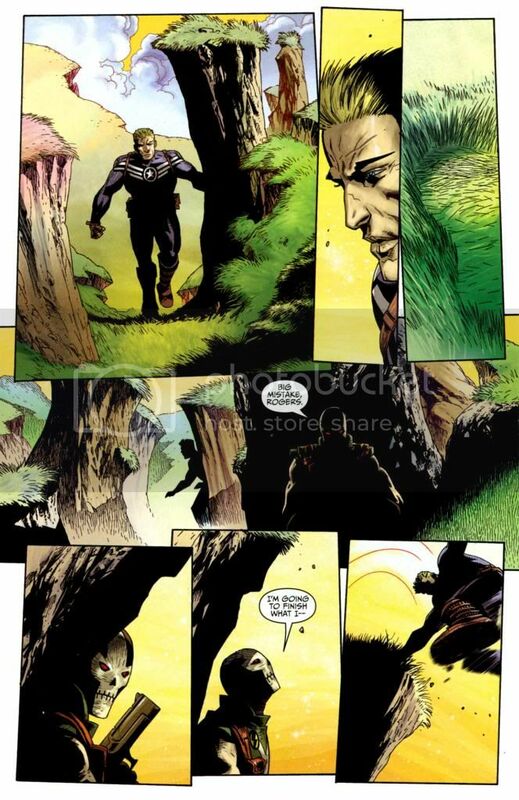 Cap outruns DiamondBack as we see Cap is so far he's just a spec on the page. 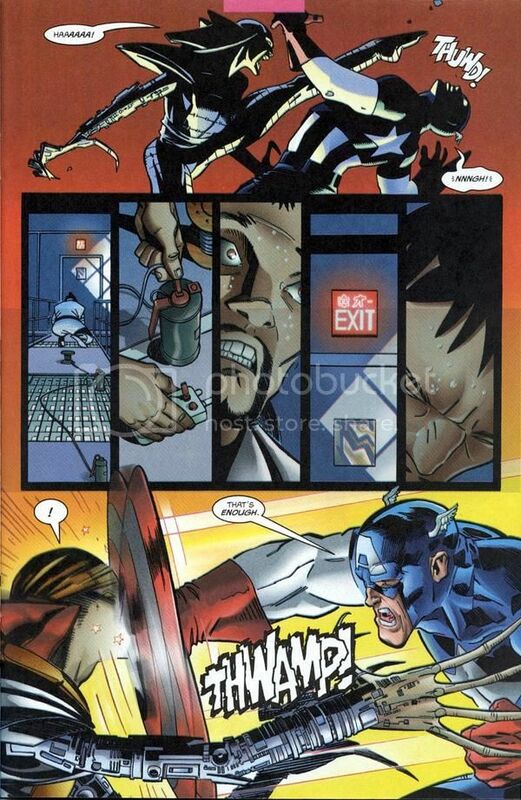 Cap runs past Daredevil like he's a breeze. 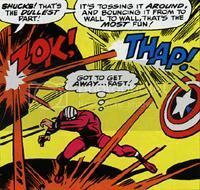 DD attests that Cap is faster than himself. 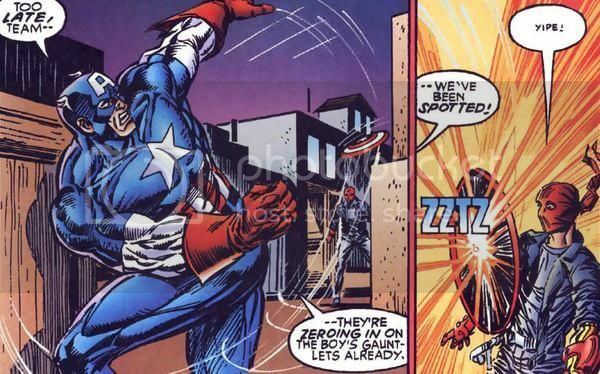 These advanced tracking balls move quick (it evaded his shield throw),but Cap can tag it. 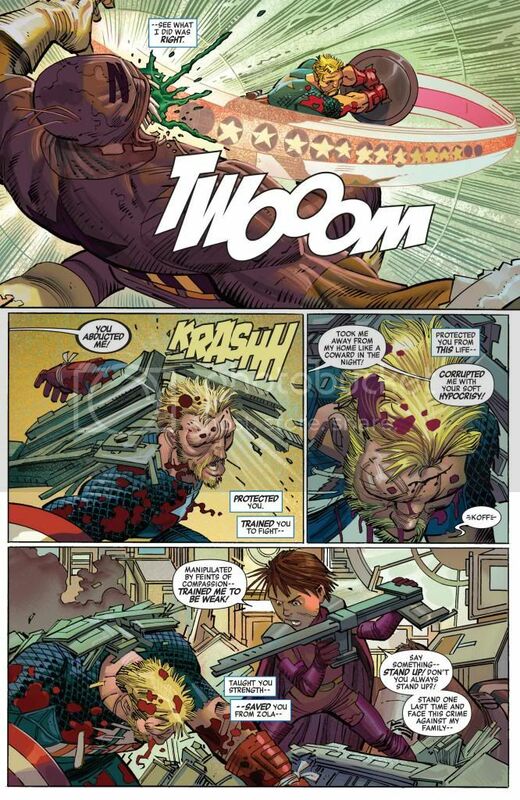 Cap dodges bullets the second guy doesn't even bother trying from up close. 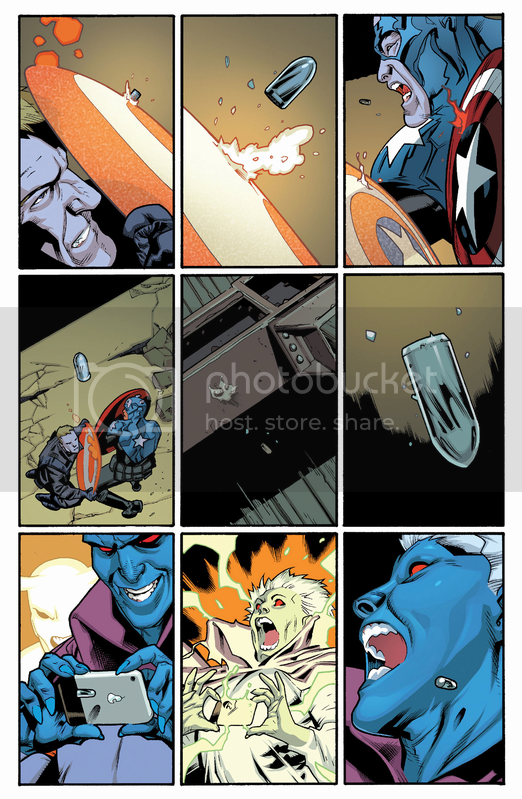 Cap blocking bullets after they were fired. 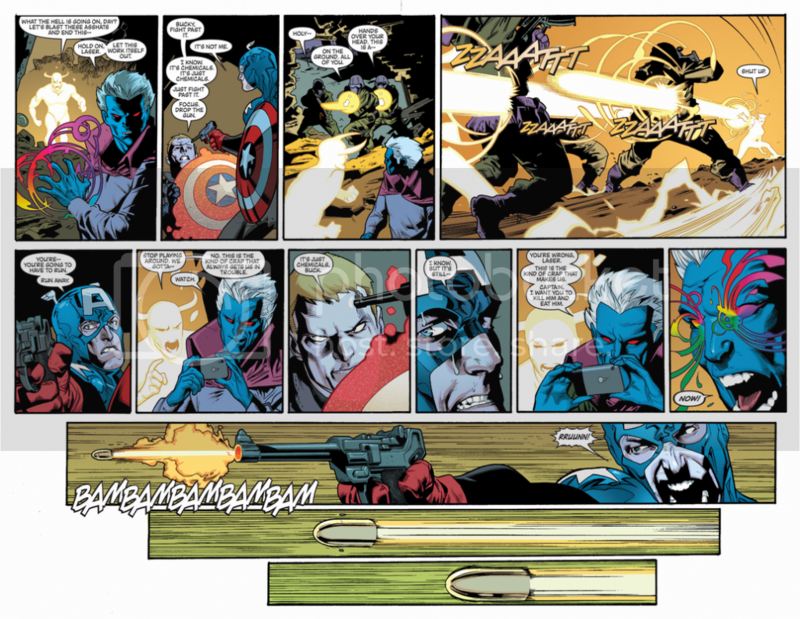 Cap blocks bullets with a shield throw. Notice the bullets were fired first. 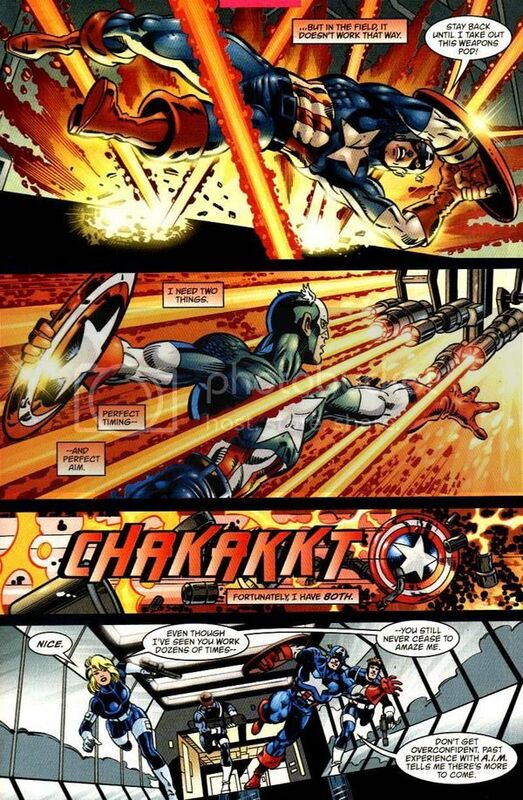 Cap is cornered by a lot of men on motorcycles who encircle him,the leader then shoots a flamethrower and Cap evades moving so fast that they don’t even see him jump away. A group of men on motorcycles encircle him and he moved so fast that they thought that they had set him on fire. 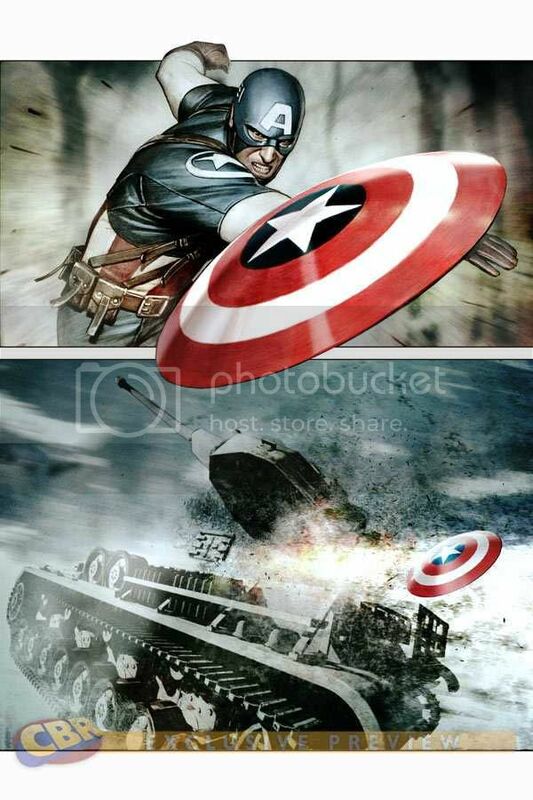 Cap believes he'd survive the crash of the train, resulting in the explosions of a dirty bomb, including TONS of C4. Twenty miles? Nothing to Cap; he's just warmed up to work on the heavy bag. 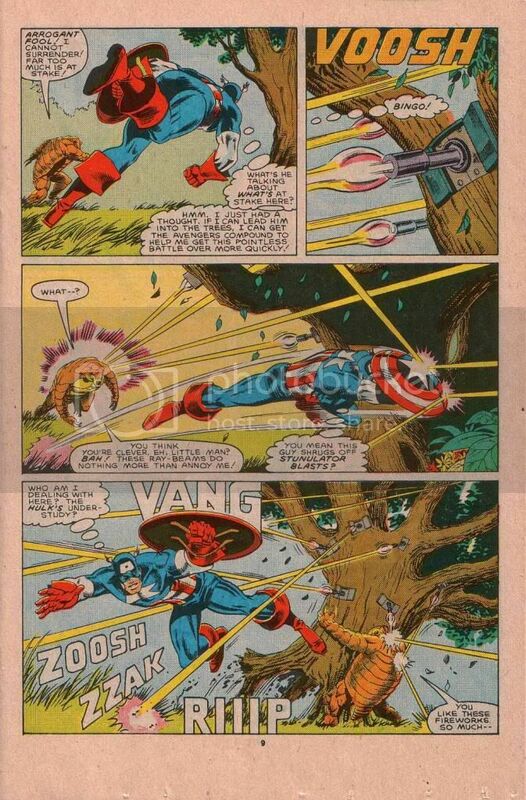 Cap easily withstands a 200 ft fall. Cap handles this nuclear furnace. 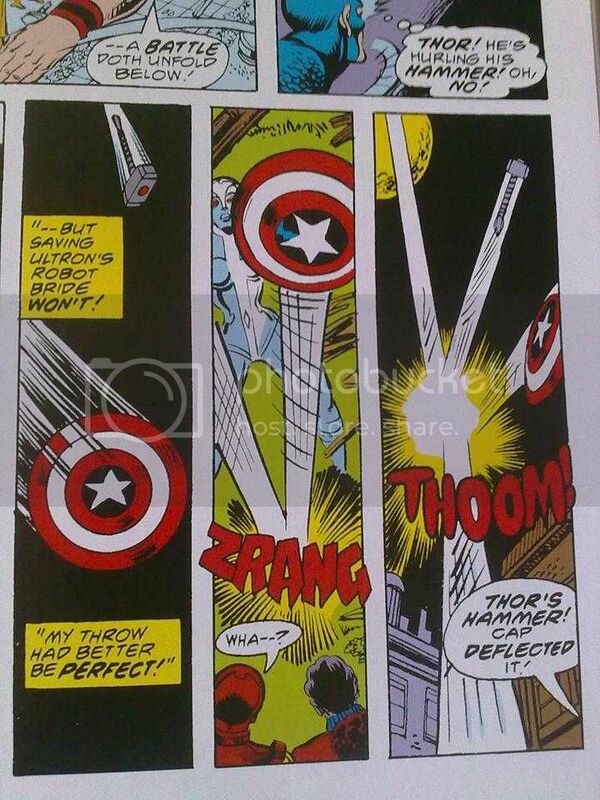 Without shield survives a extreme high airplane crash. Jumps out of helicopter leaves small foot craters on ground. Jumps out of helicopter onto vehicle. High quint-jet fall strikes Onslaught on the way down. 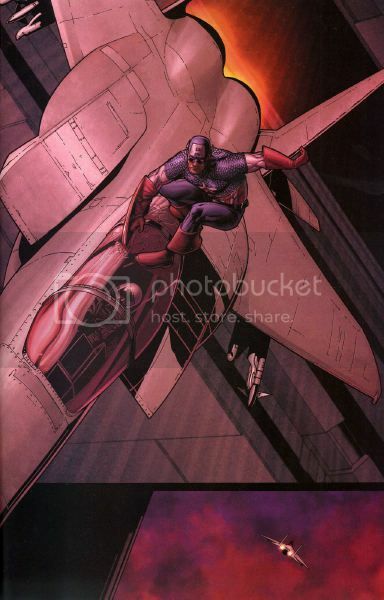 Cap falls, notice the Quinjet is close to the buildings height. Cap falls, releases from parachute. 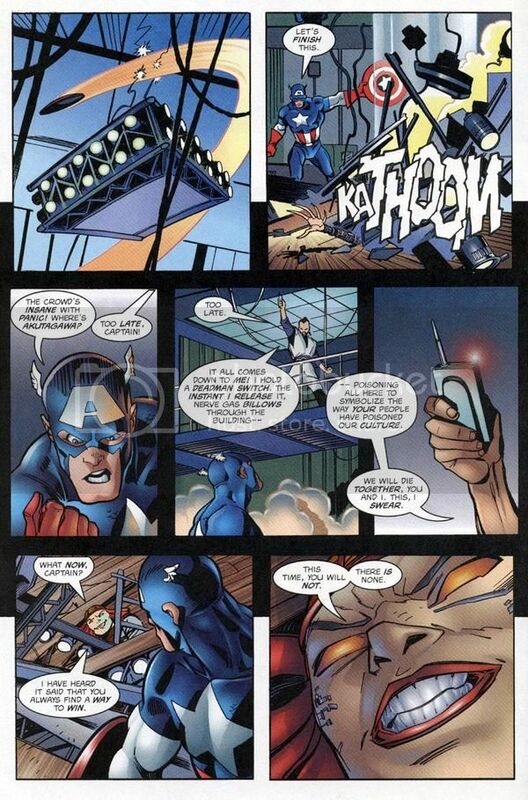 Cap jumps off a building through the glass of another building and lands on the ground of the the second building. Cap falls from two or three hundred feet before crashing in the ocean. Falls off a building to the top of another building. Fall from a high-Shield building. Leaps out of a crashing plane into the ocean. 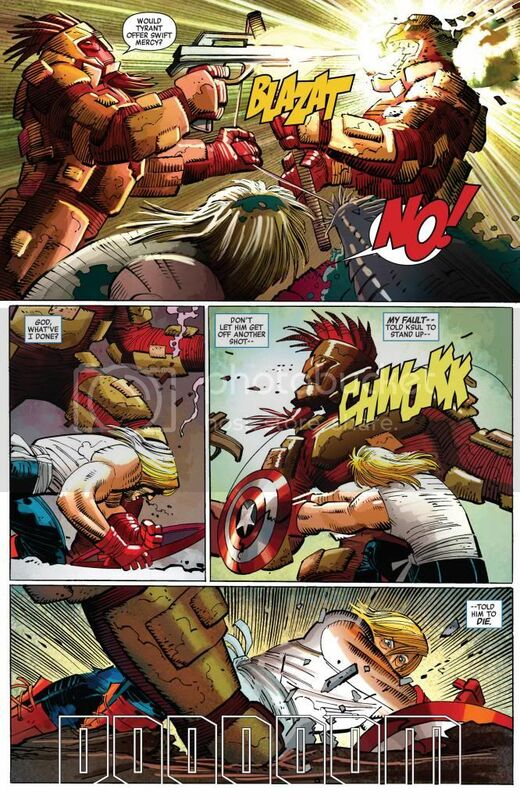 Insane fall traveling over 100 mph, lands on the hard Thing Ben Grimm. Canon ball crash into ocean. Falls ontop of a Shield Sub? Gets hit by a vehicle going 40 mph, doesn't hurt him much. Survives being crushed by Dragon Man. 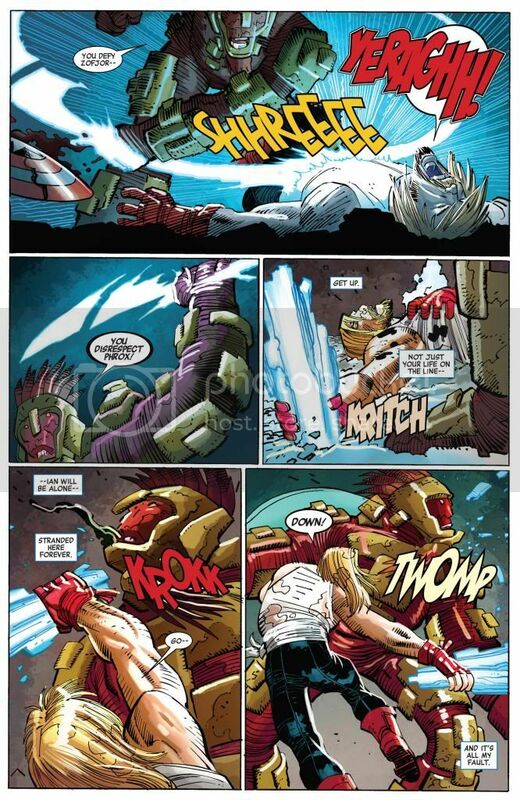 Entire building falls down as Cap, as the Red Scull uses Cap's durable body as the wrecking ball "ouch". 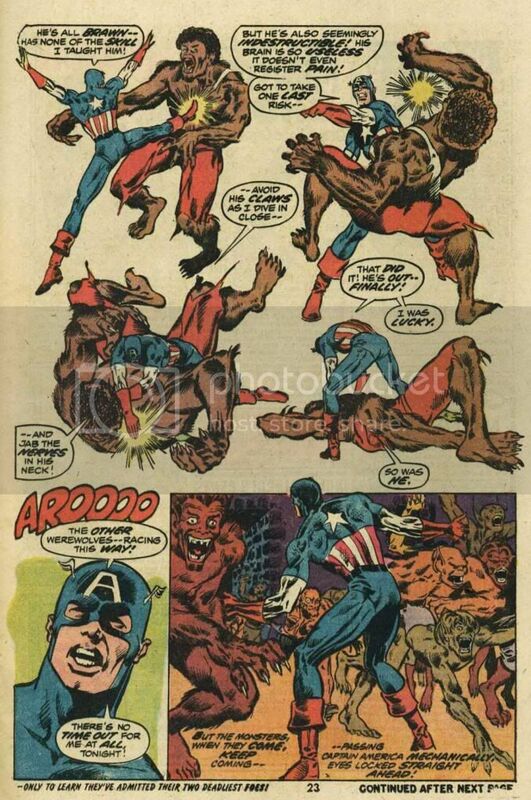 Cap takes a nasty beating from Namor. 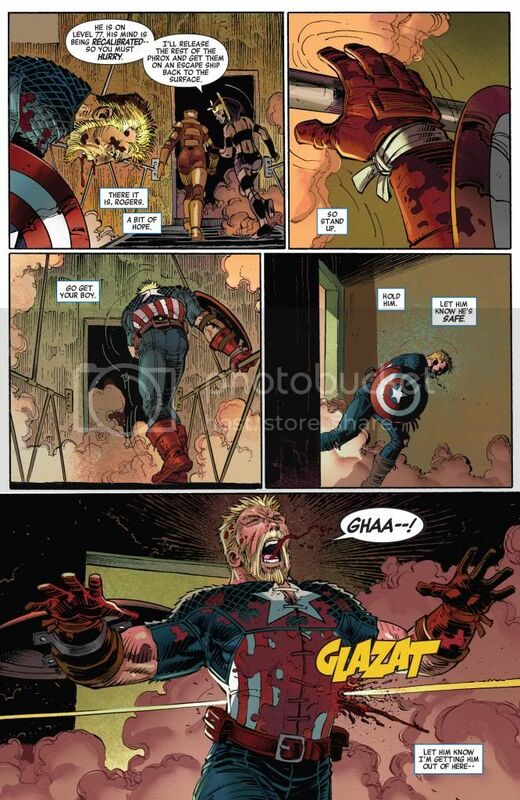 Cap takes a nasty beating from a blood lusted Ironman. 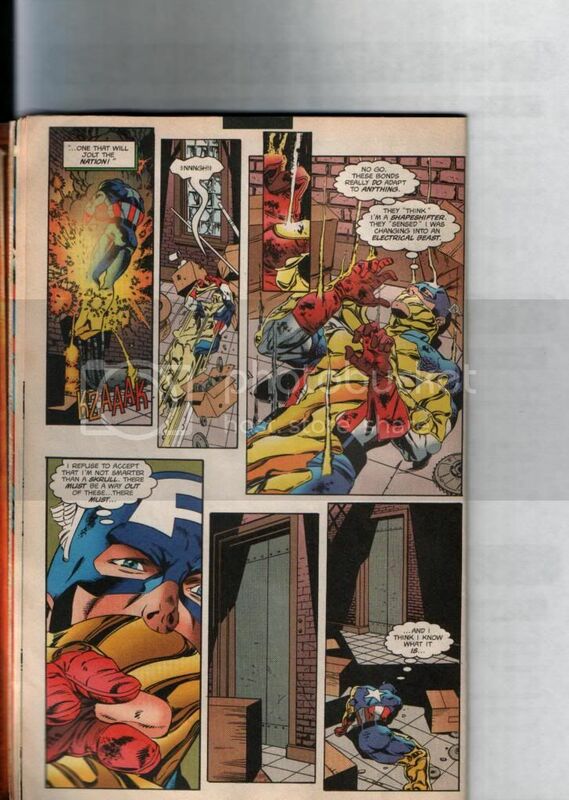 Even worse in Civil War attacks from Spiderman/Ironman and then some. 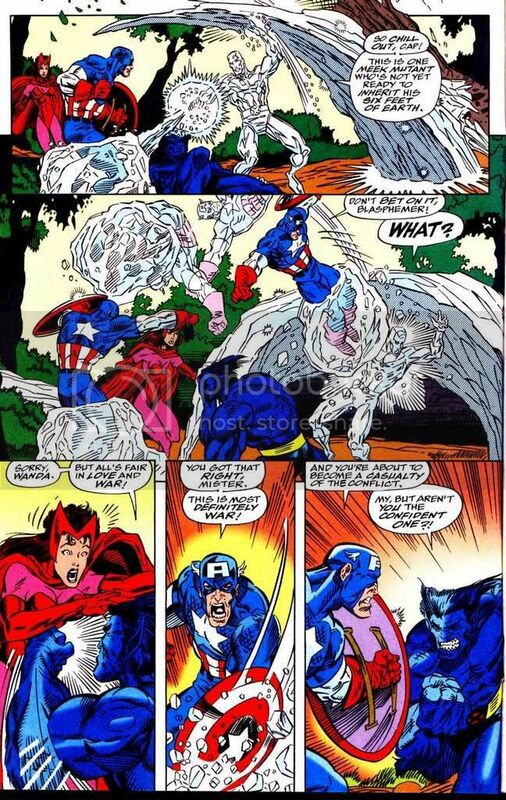 Air Walker herald of Galactus blasts all 3 Cap, Ironman and even yes Thor. 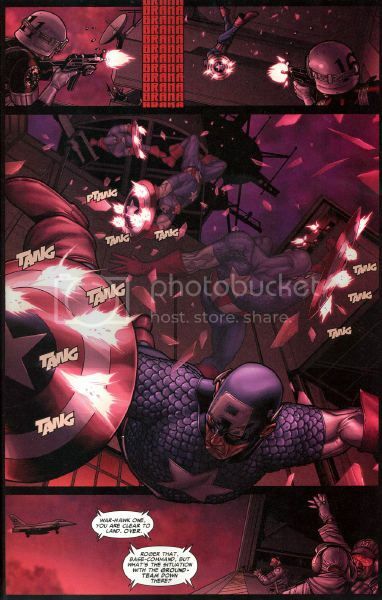 Cap takes the brunt of the blast as it engulfs all of them in it. 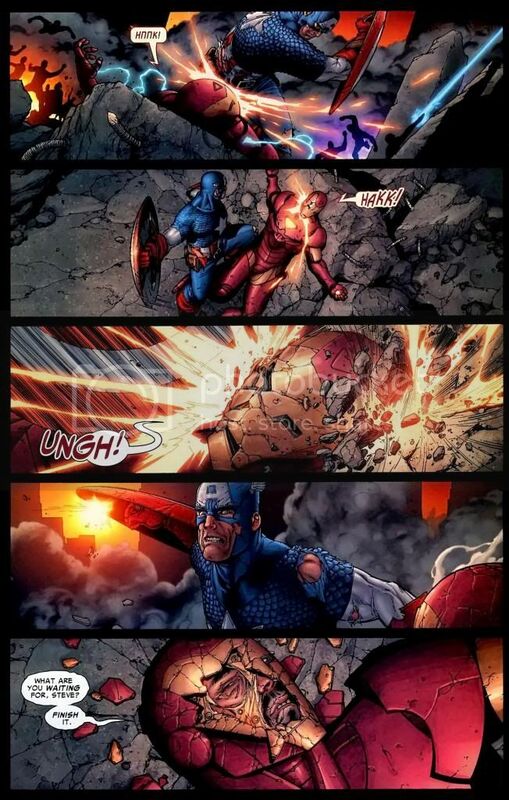 In the end its Cap who's carrying both Ironman and Thor. 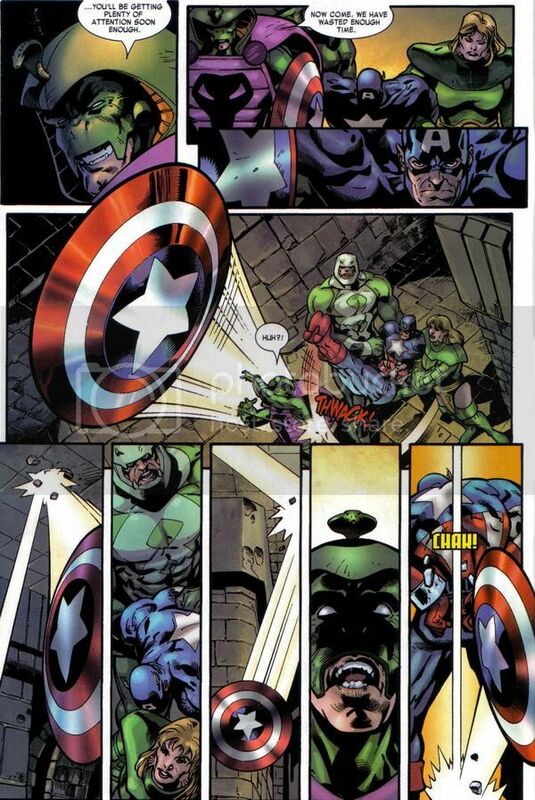 Cap with his shield has blocked lots of things like explosions to even hits from Hulk and Thor. 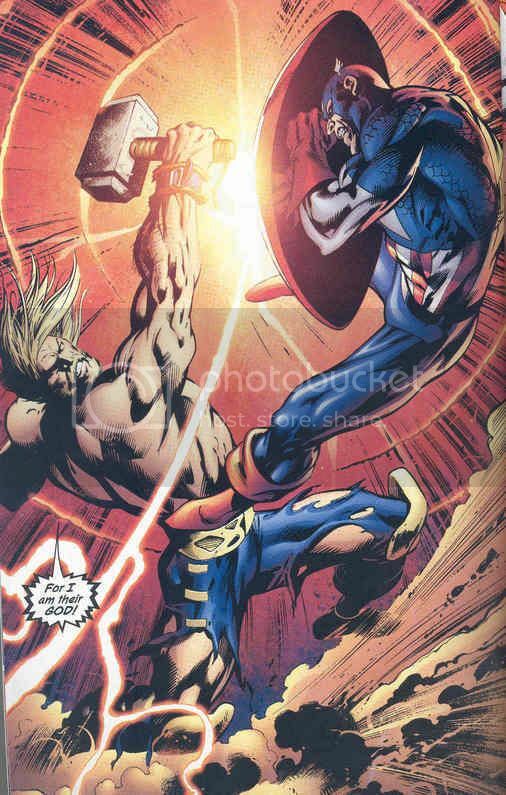 Most don't consider it too impressive because the shield absorbs the impact, but lets see how a regular person does who blocks two direct hits right on the shield. 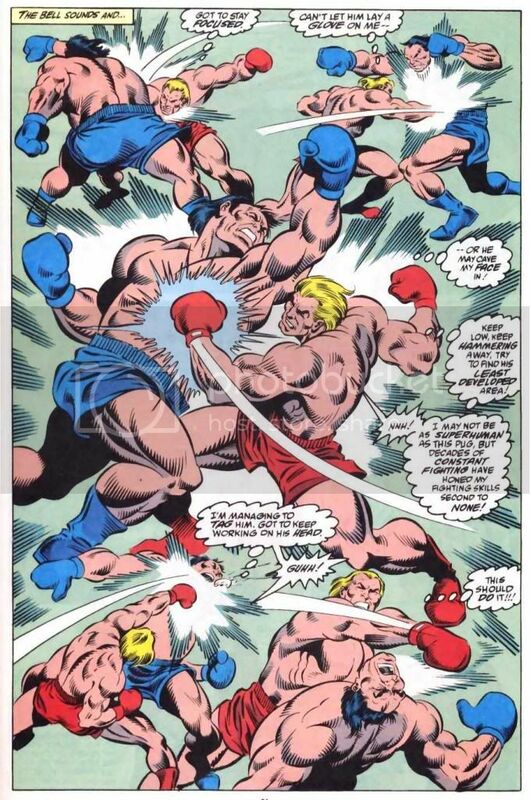 Takes a beating from Namor when they first met. 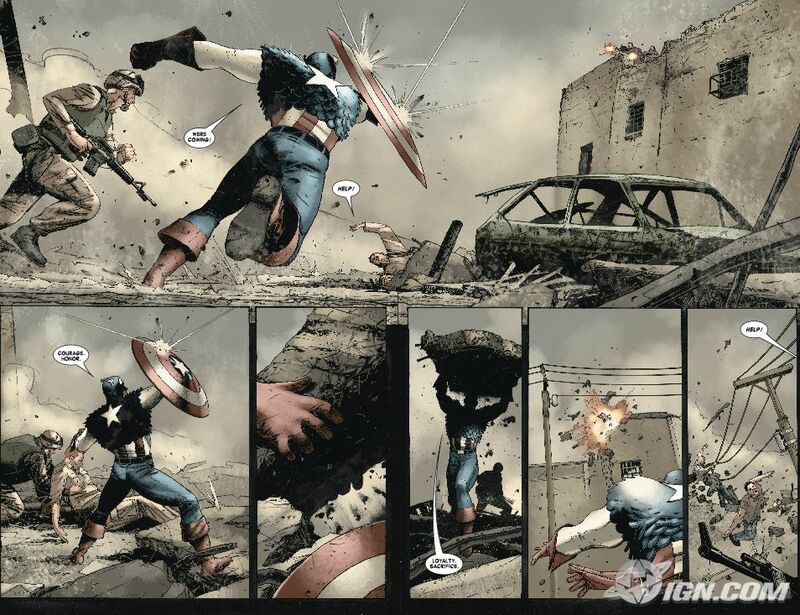 You can see the boulders being smashed to pieces and Captain America’s bare skin is hitting them. 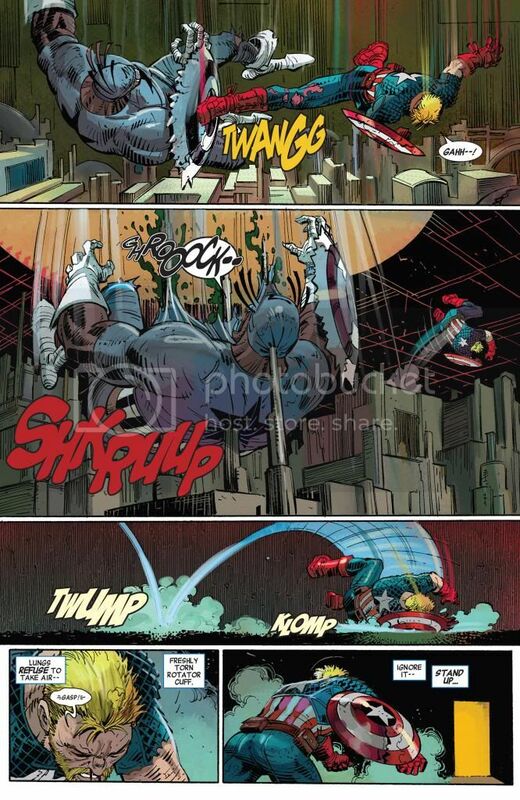 Then falls another great height and hits metal structures along the way. 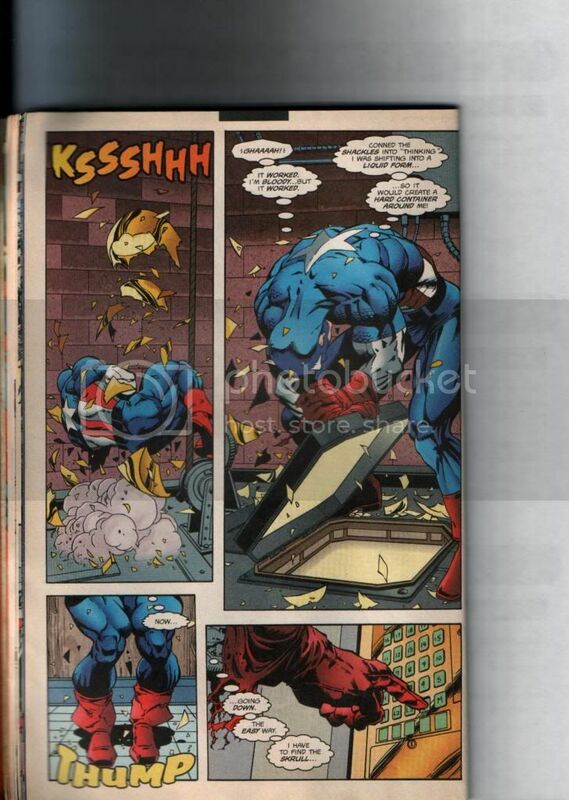 Cap gets beat up by a super suit-wearing Red Skull (getting smashed through walls and such) and the entire building falls on him. 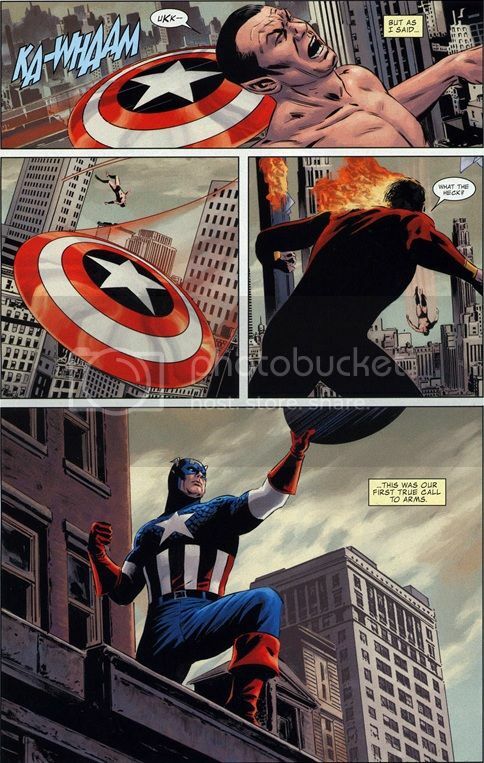 Cap doesn’t need a parachute. 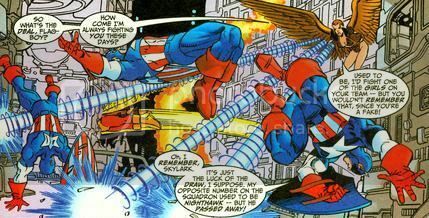 He leaps from a great height from a helicopter and lands on his feet shattering the surrounding concrete and is completely fine. 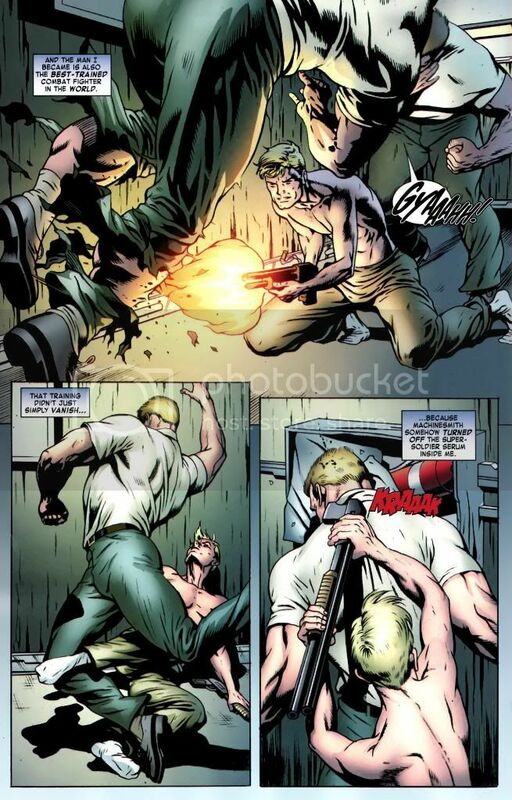 Cap is in a car filled with assault rifle rounds,which hit him and Captain America doesn’t have on his suit or his shield meaning this is just him taking these rounds and he takes 7 in just one arm. Not to mention the other ones he catches.... and he is unaffected, he never squirms or winces, in fact he starts shooting back as if the bullets arent even there. And in the next panel he is completely fine. "My metabolism doesn't let me get drunk. "I don't get drunk I can't." Keeps up with Logan in drinking as they already been to 5 other bars. 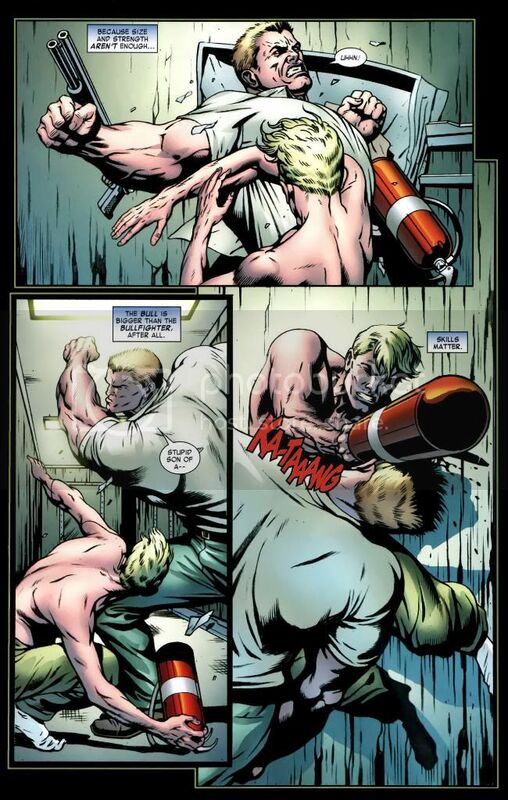 John Steele who can throw jeeps like baseballs and has bullet proof skin does a elbow strike on Steve's leg. 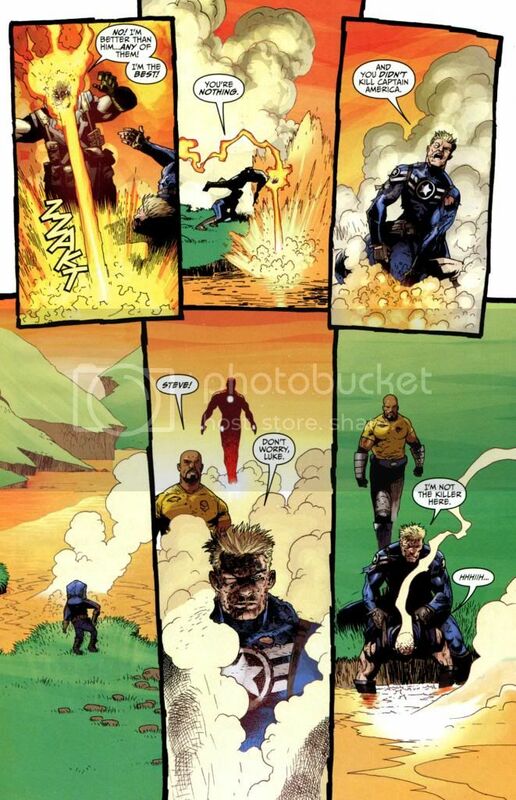 As Steve tells Beast "I heal fast". 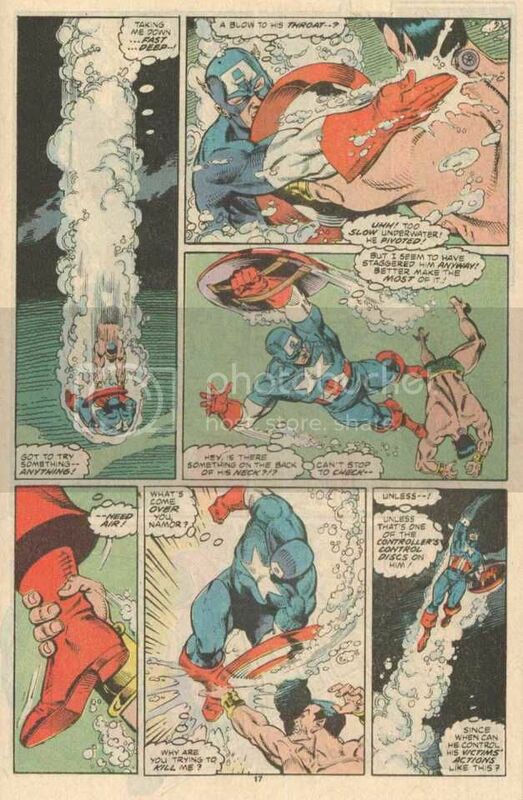 Cap's hands are burnt bad in the fires. They'll heal once were out of here. 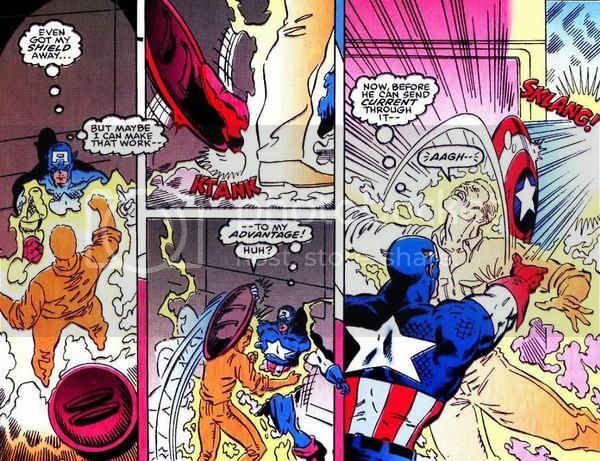 Cap got burned from alien tech. "Amazing his burns are already healing". 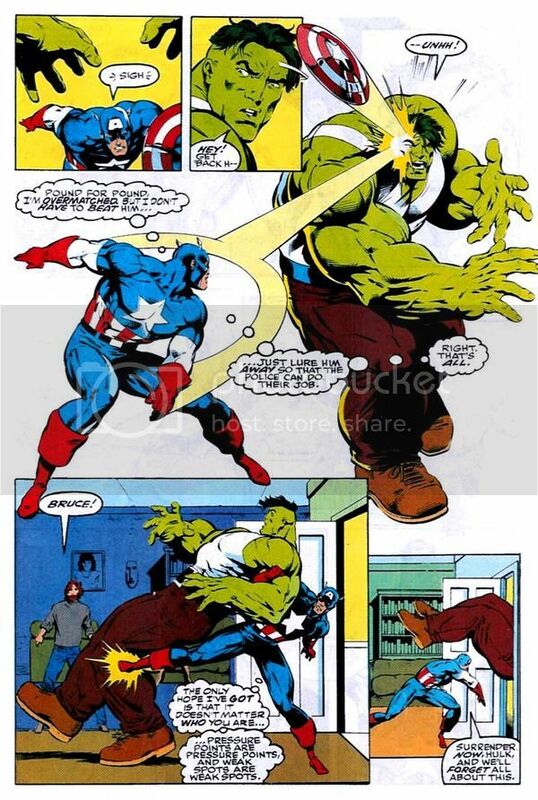 Bullet to the shoulder no worries for Cap. "I heal fast" "I'm built that way"
Was offered paramedics for being in a bad explosion. 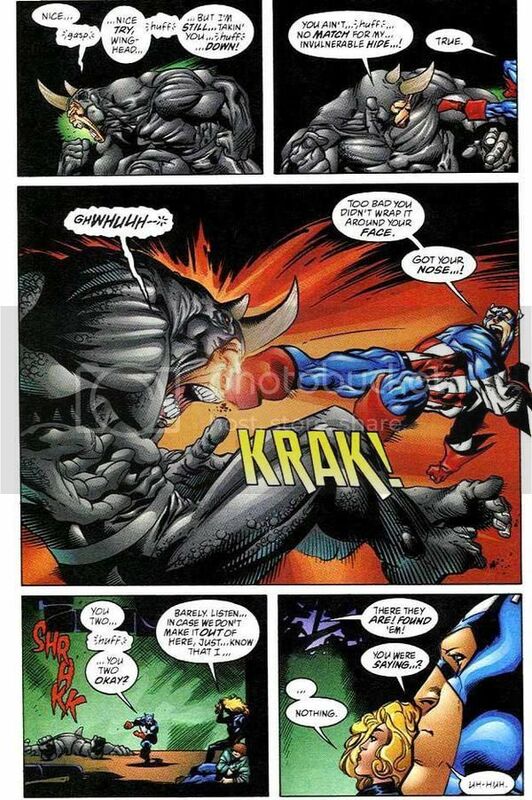 Cap's answer "not necessary"
Cap takes a thrashing from Namor. 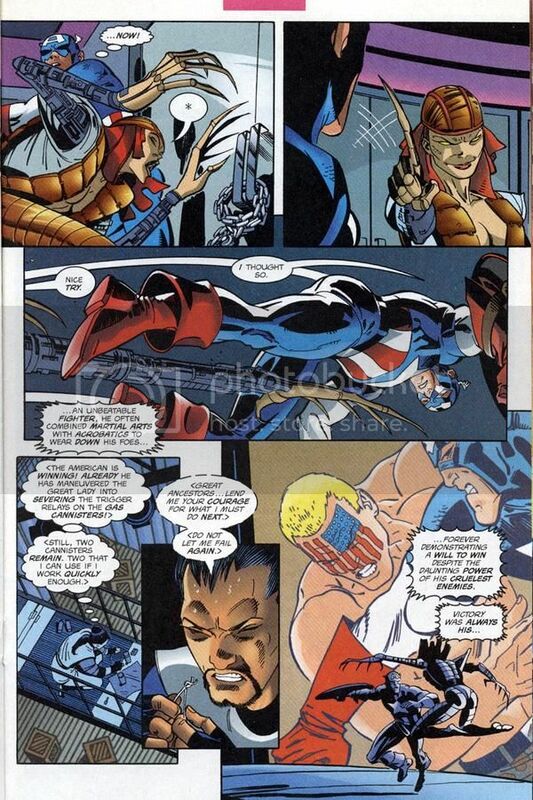 Namor impressed how quickly Cap recovers. 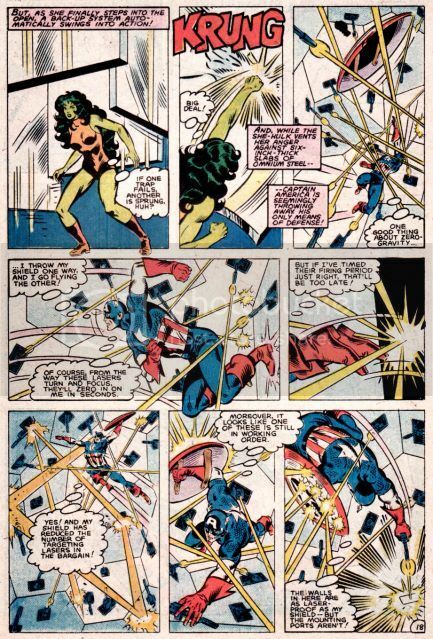 A alien agent was affecting many including super humans like She-Hulk, but not Captain America. 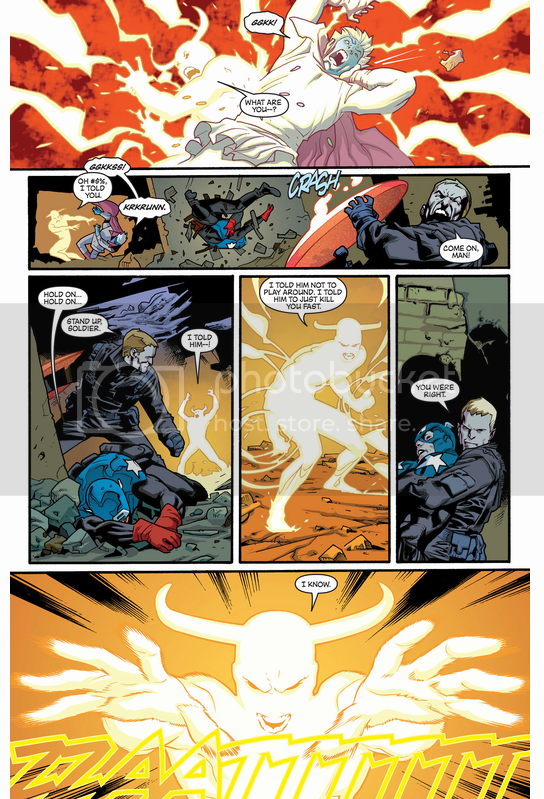 An aging formula that makes you old an die affect Cap and the Red Skull. 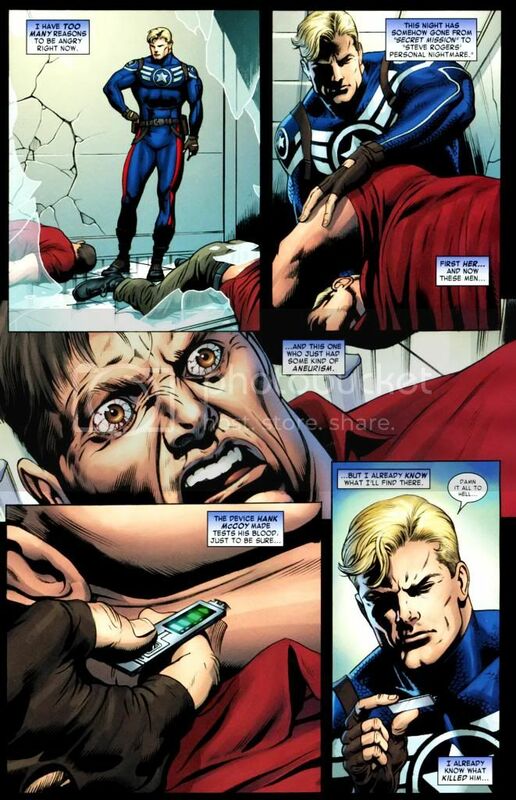 It eventually killed off RS as he couldn't handle a fight with Cap(Red Skull didn't have a cloned body of Cap yet.) 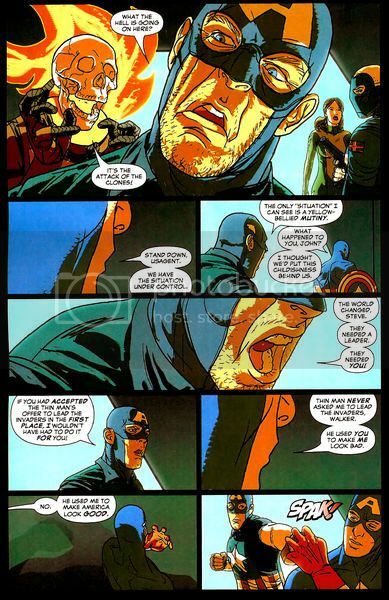 But Cap mentions the SSS is what is keeping him alive despite it rapidly aging him. 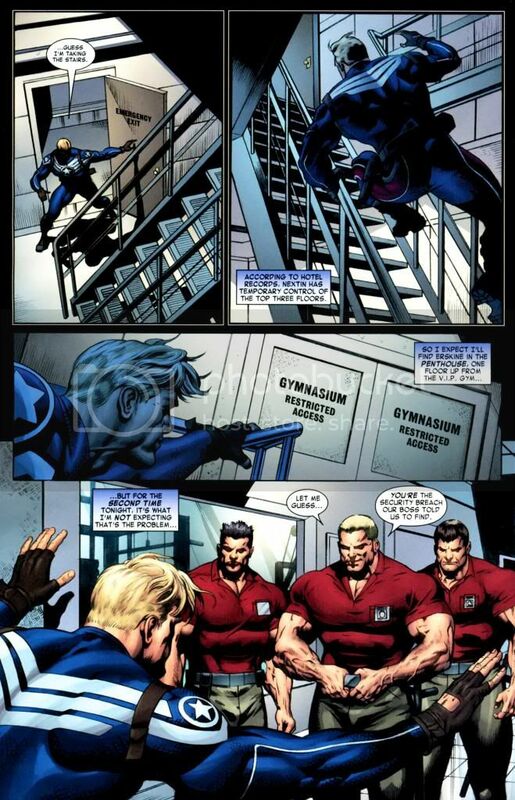 A process to turn men into perfect woman was tried on Captain America and superhuman Paladin. 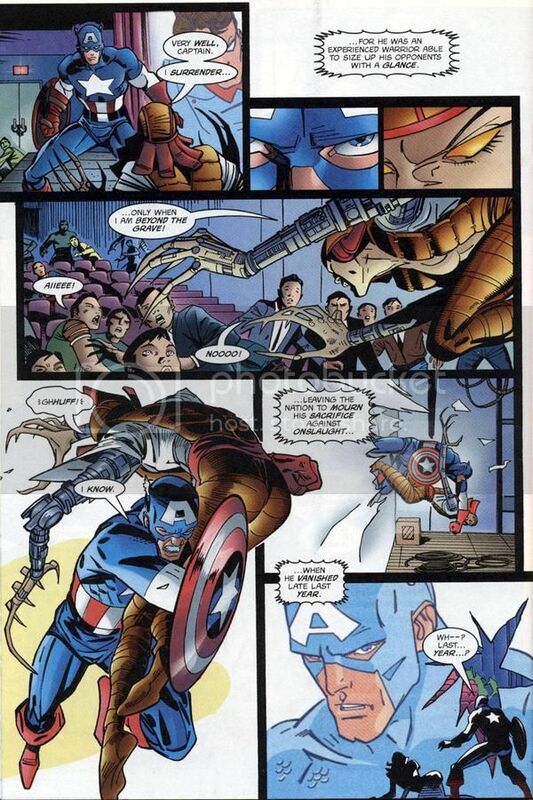 Notice there more worried about Captain America. 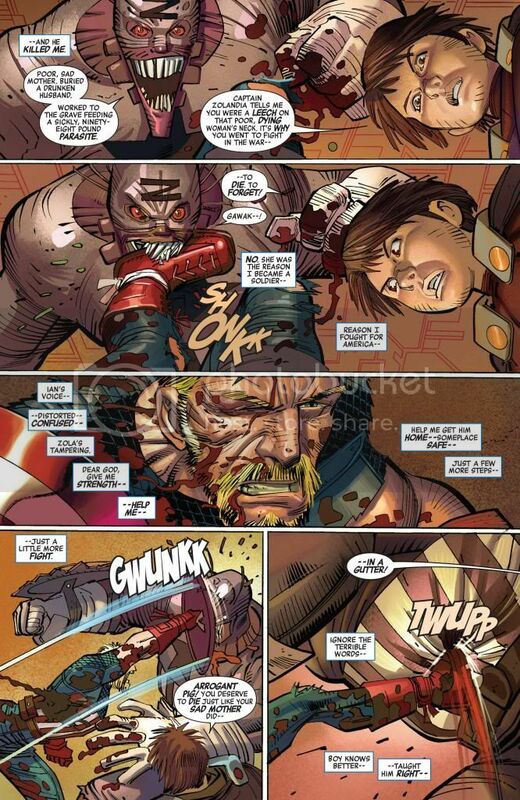 Again a lethal virus created by the Red Skull. 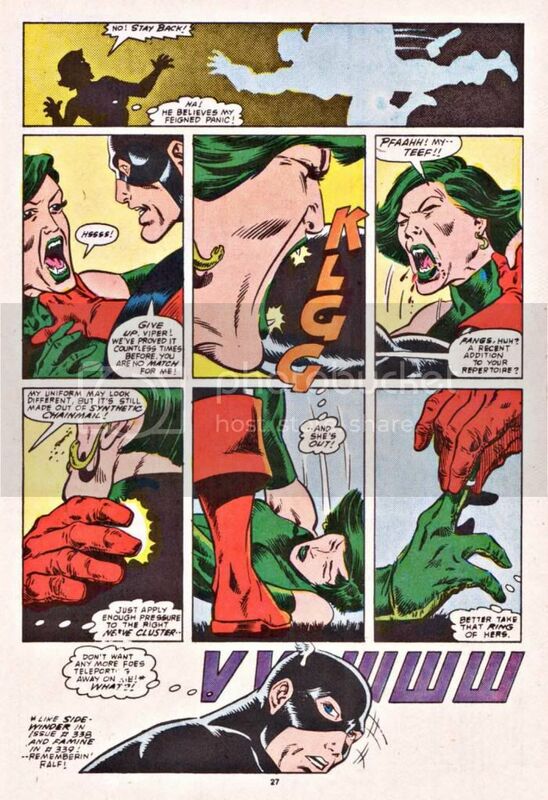 It killed more then 1000's and affected She Hulk badly as it put others like Scott(Cyclops) in medical care for a long time. 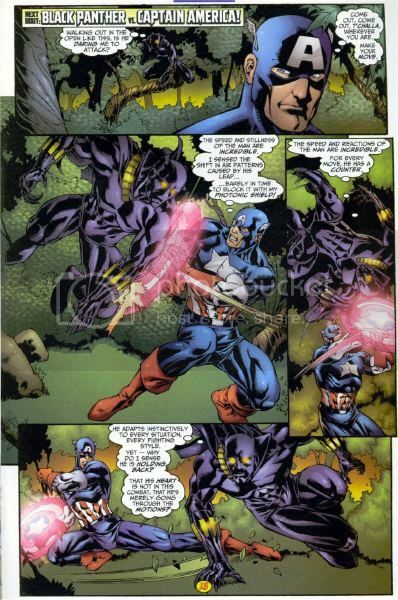 Cap was exposed to it throughout most of Black Panthers/Ironmans fight with Skull. 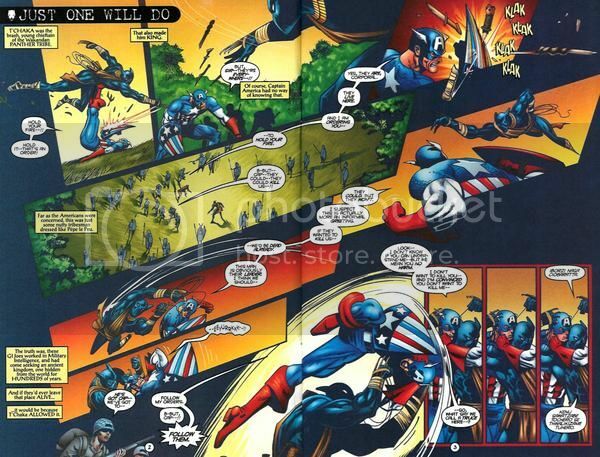 Remember the punishment Cap took in Civil War he recovers rather quickly for his rematch with Ironman. 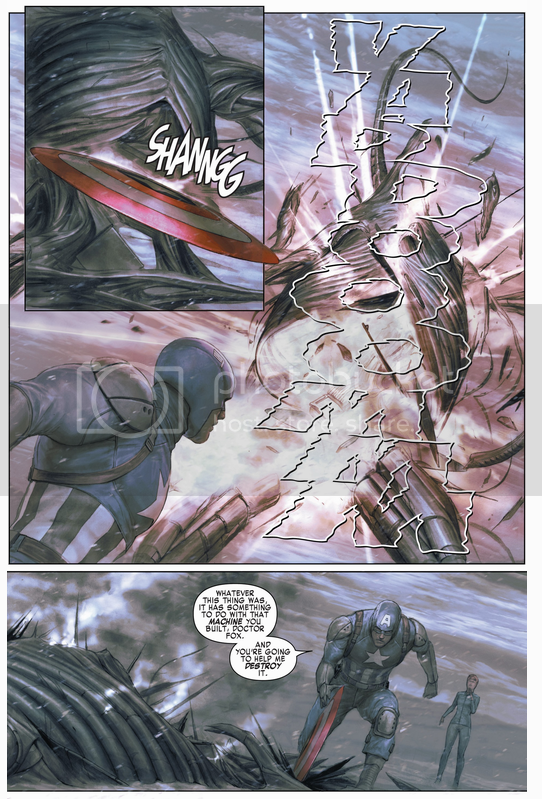 And hear Cap looks healthy despite what he took previous as he even has the advantage on "Extremis" Ironman. Tony's even down and puking. Bullet to the head lots of blood splattered. 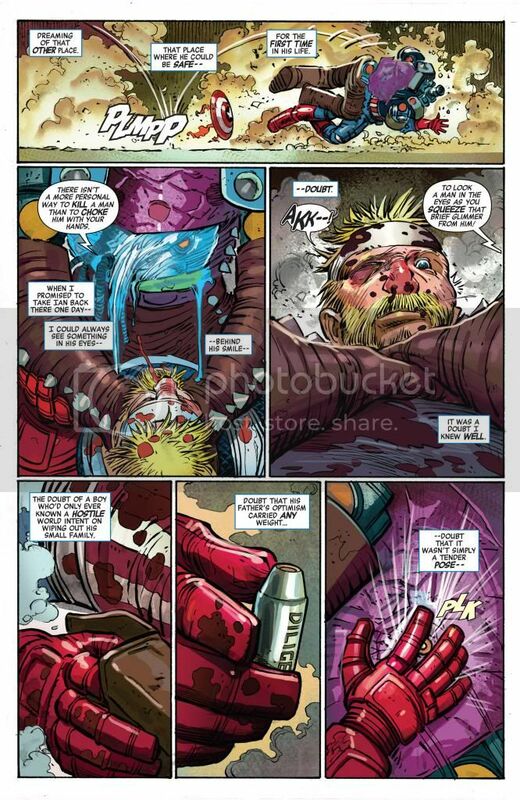 Steve died and healed a bullet to the head. 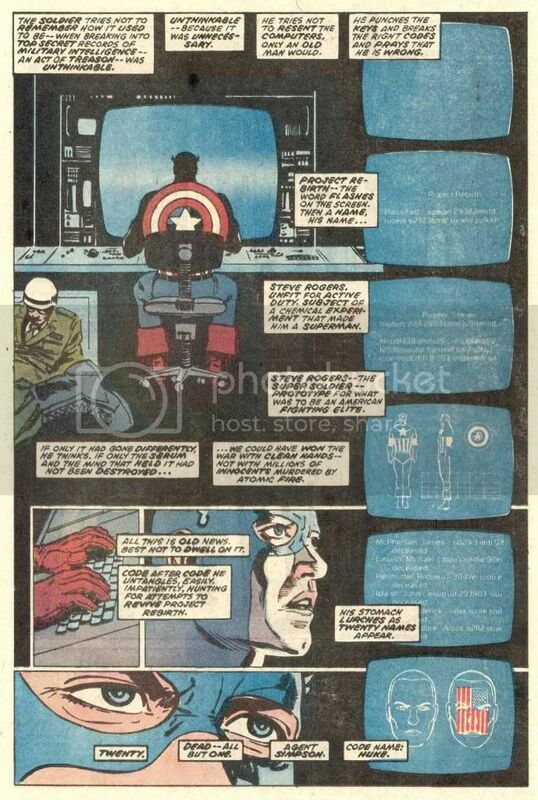 The SSS grants slowed aging and Cap's other enhancement from WW2. 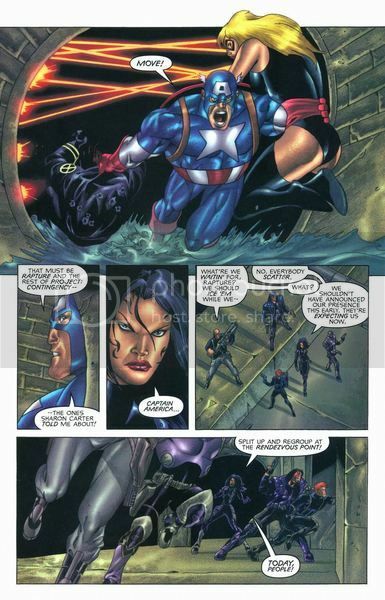 Sersi a eternal notes Cap like her is "ever youthful" as she can wait for Steve. 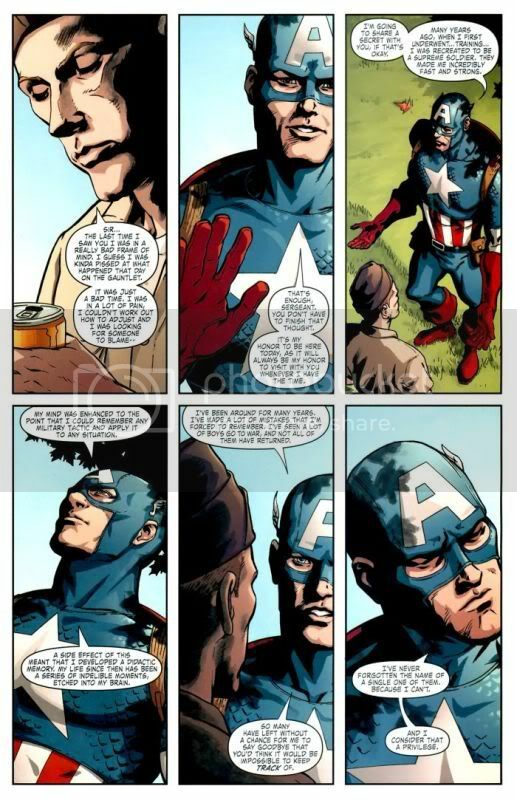 Cap is eternal like Hydra. 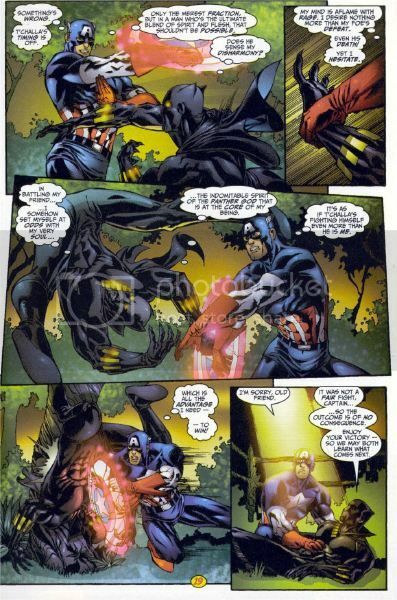 Which helps explain why Cap always comes back from the dead. 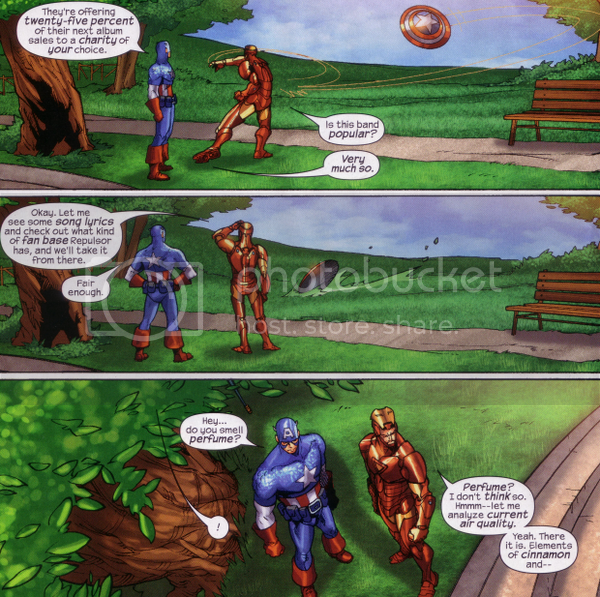 Old issue Cap contemplating possibly being alone forever. 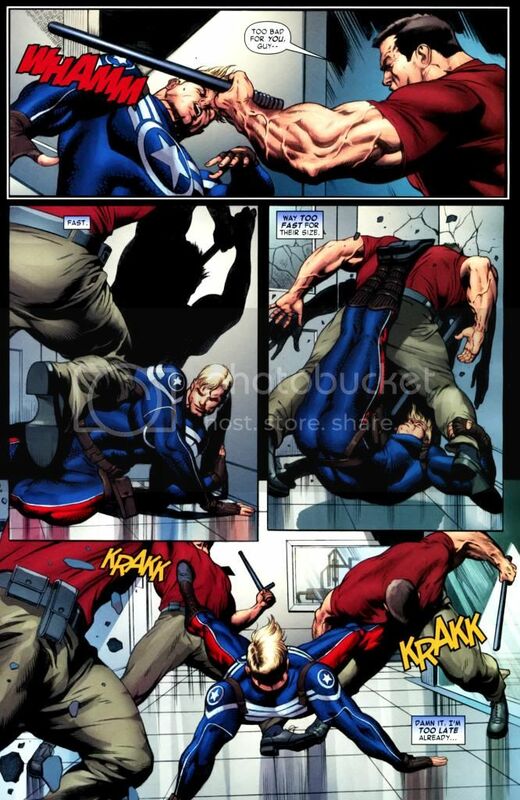 After just gaining his peak attributes,Captain America jumps approximately 10 ft (or more) to catch Dr. Erskine’s killer. 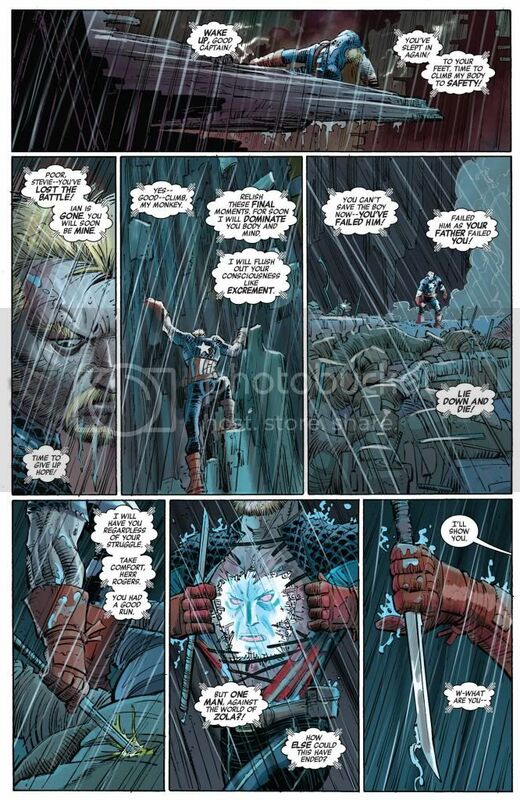 Cap is able to force an underwater Namor (who is mind-controlled) to release his grip - twice! 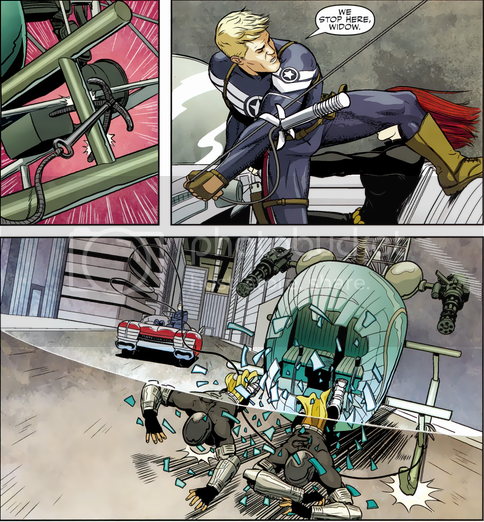 Cap pulls down an entire small helicopter with 2 men inside using strength,sending them crashing through the windshield. 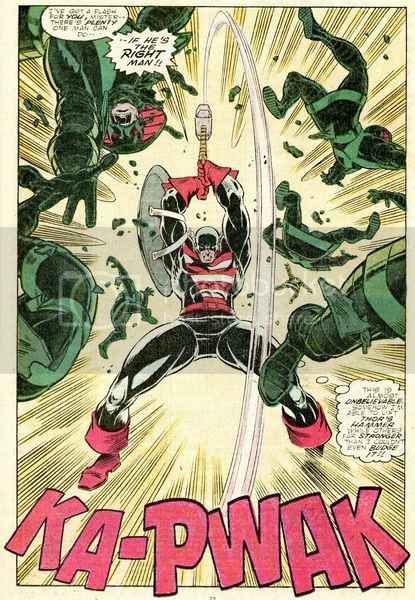 After being stabbed in the chest with a huge needle filled with dope/sleeping agents,he rips through steel restrainers and throws his shield through Zola’s machinery with enough strength to destroy them in a consecutive path. 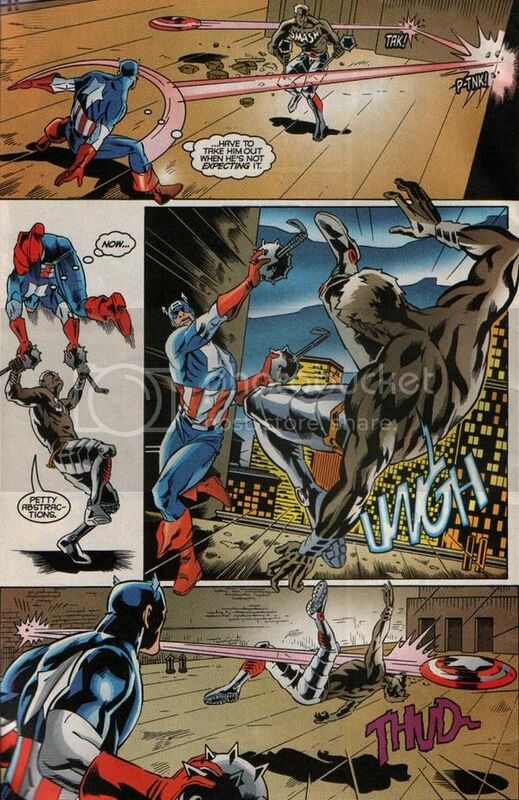 A skyscraper falls on them and the only hope Cap has is using the impact absorbing shield. That scan makes it clear that it can only take so much of that weight. This shield absorbs the force/impact and momentum but it doesn't make that weight magically "disappear". This is a momentous feat for sure. As it states the rest of the weight is being held up by the mightiest will on the planet. The Superhuman Berserk tilts a car over Cap, as we see later the car is upright. 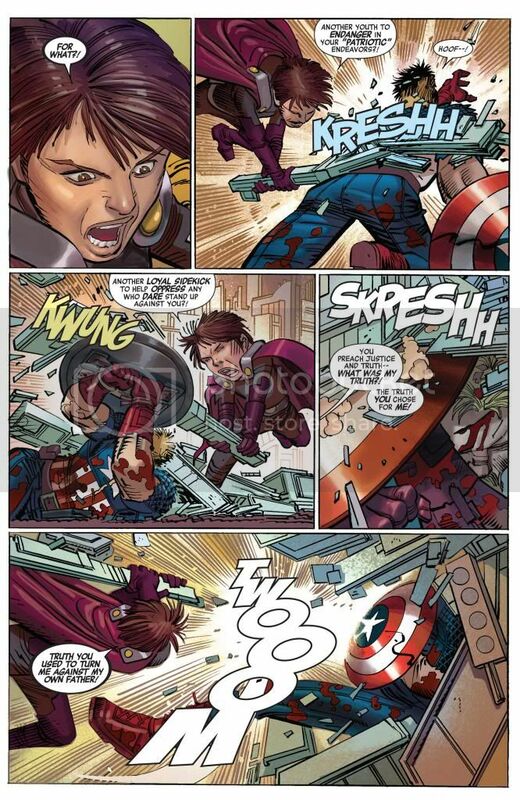 Cap keeps open the Gamma-Core emergency door, huge doors that self-shut for emergency. 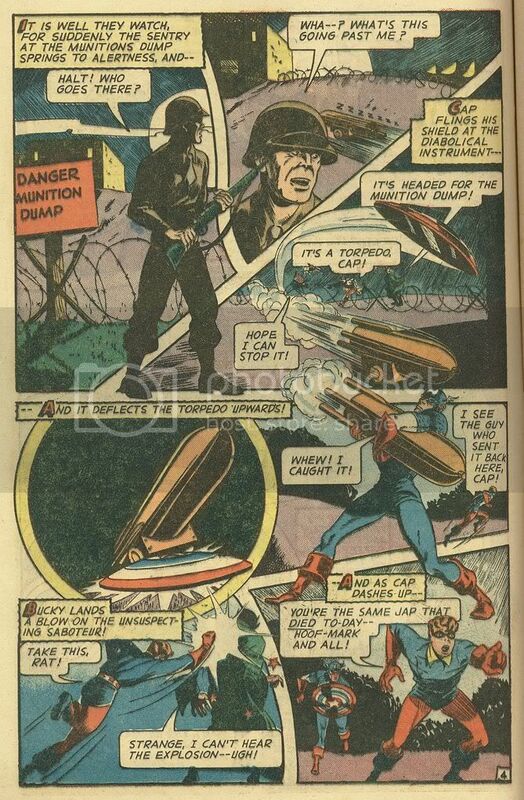 Cap lifts a big piece of debris off. 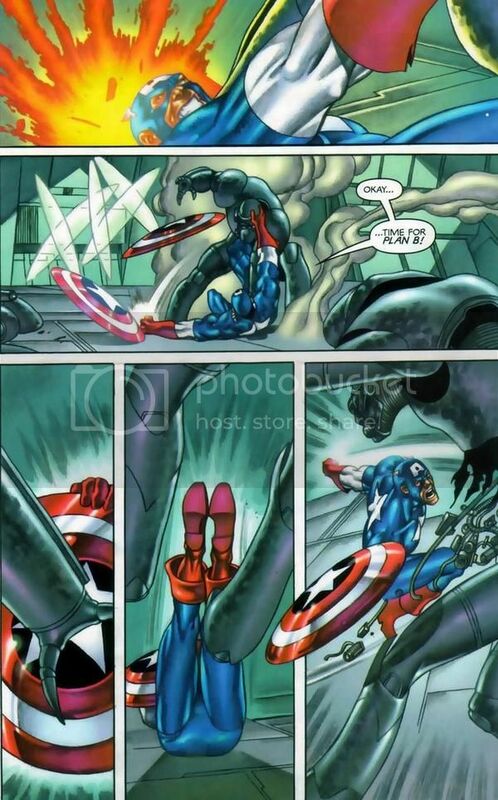 Cap easily deflects a statue thats stated to weigh a Ton or more. 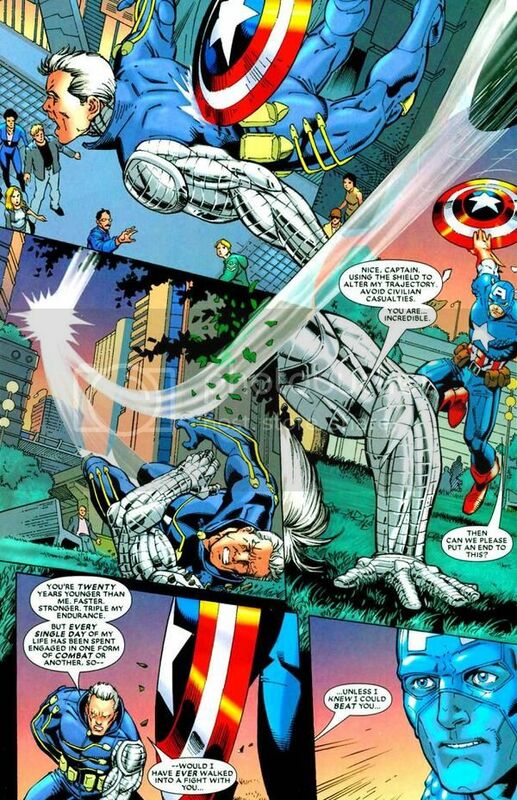 Cap tilts over a big heavy statue that he's chained up too. It's still a preliminary post. But this is the gist of it. There might be some double posts, if there are please help and point it out to me. If there are any scans I do not have here that anyone would like to share, please PM or message me here and I will do my best to edit and update the OP in a timely manner. 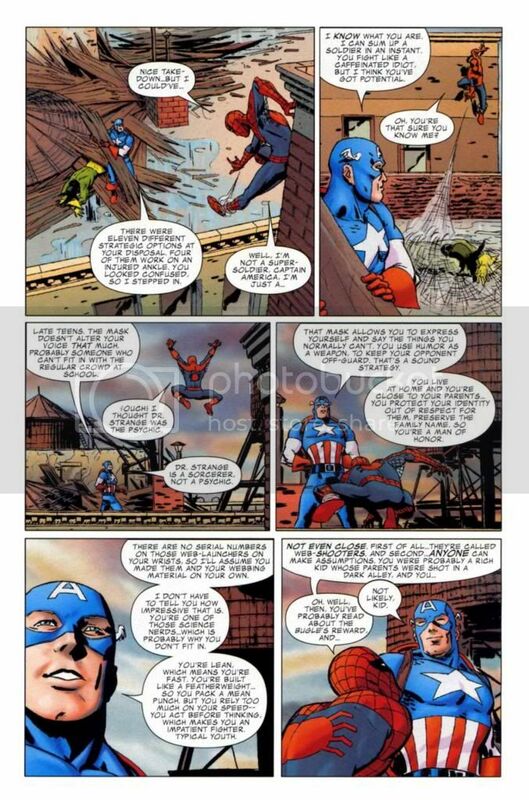 A thread that captain america has needed on the vine for a LONG time. Good job,and I will update it when I can with new scans that were not covered if I can. 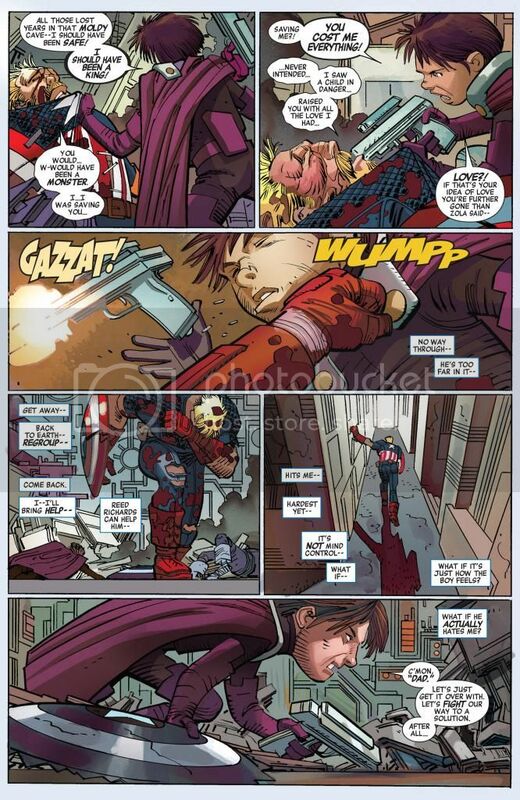 And we should update with scans from Infinity and Hickman's run along with various other ones,like the tons of ones (also strategic ones) in Civil War and other miscellaneous comics (like singular issues). Whoahoho this is great! Nice job! How do I edit @slimj87d ? Or can you do it? WOOT WOOT. Cap is up! We kinda need to edit and clean through the post a bit though. There are some duplicate feats, some feats that have yet to be posted, and a lot of inaccurate statements (my fault in some) and context that need to be noted. 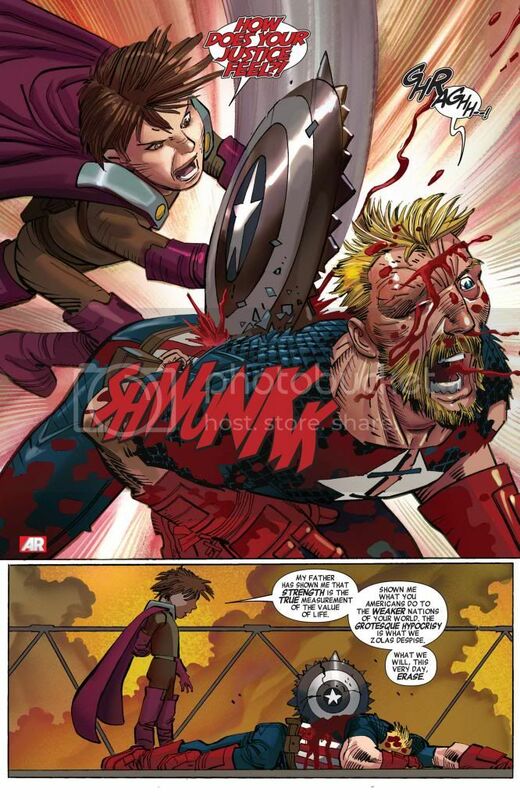 Damn Cap finally has a worthy respect thread for his feats! 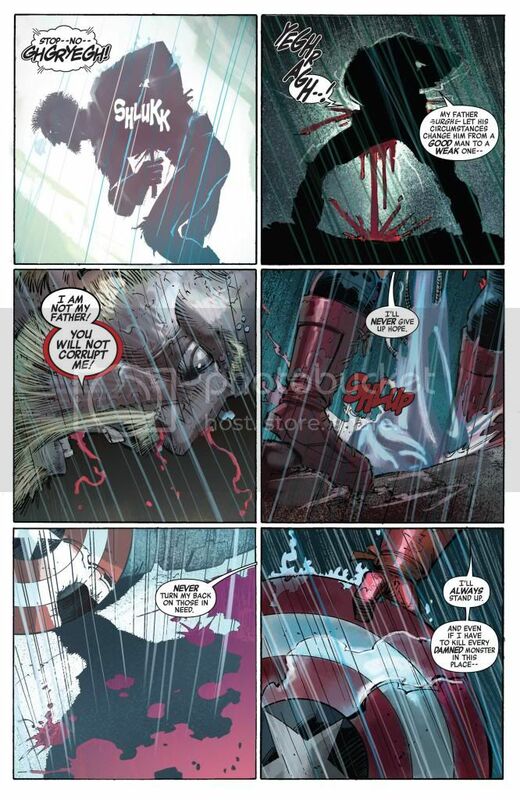 I wish I had this available when I did that Kraven vs Cap debate with ComicStooge. In any case, I'm gonna enjoy siphoning through these feats later. 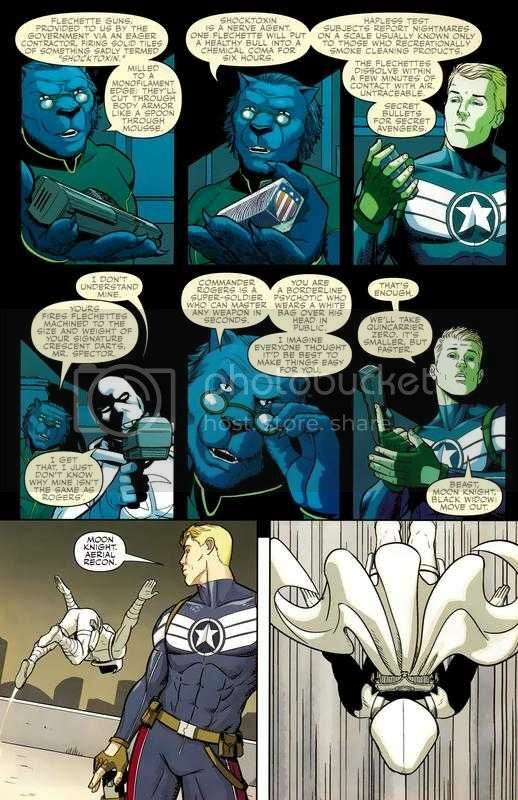 @slimj87d I found something that can be added in Super Soldier Serum. @cameron83: It's hard to say if that's due to the SSS. It could be that her hearing isn't good. Would you agree? But still,I think it was meant to show his great hearing of those vehicles from far away,but I guess that that CAN be said about her. But at the same time,we're supposed to assume that she has average human capabilities. We will add new stuff when we can! @cameron83: @slimj87d: Good job guys!!!! The thread is great!!!! Two feats that I wanted to add. Remember when Hyde rammed Cap at 40 mph with a cargo van as it didn't even phase Cap? 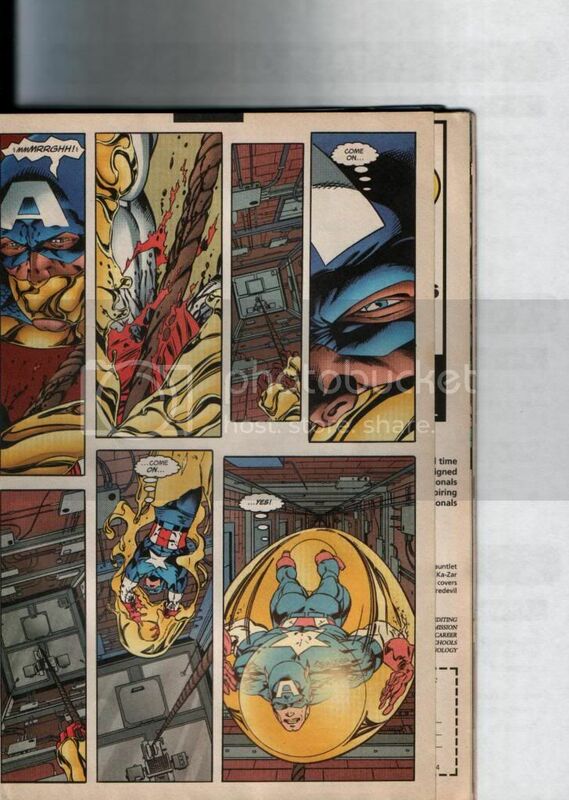 Here Cap gets rammed by a super big rig as you see the face impact on it. This was unable to KO Steve! Super jump Cap makes it at the top of the ship, it also appears he got burnt by the heat engines. @krauser99: Thanks, @cameron83 will have to add it to his second post. For some reason, you can't edit OP anymore. This site got much worse ever since they revamped it. Some golden age era super feats. Stops a car easily and back hands groups of people on both sides. Here is a cool strength feat. What's funny is I saw another superhuman in the same situation recently and he could not do anything but knock on it like a door until they opened it for him(Angel the vampire series). Submarine under water. 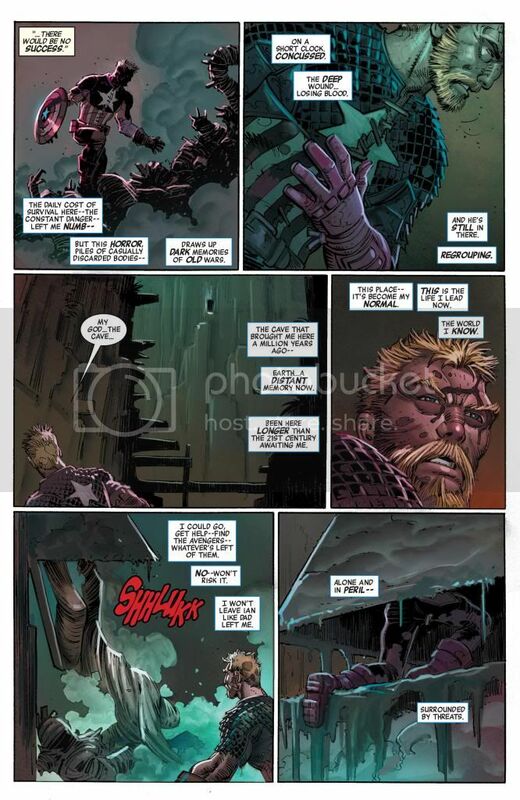 @comicstooge: well this respect thread was a huge collaboration. I think Veshark knows the most about Walker. @krauser99: @veshark@slimj87d: Wow. Some great new feats,guys! 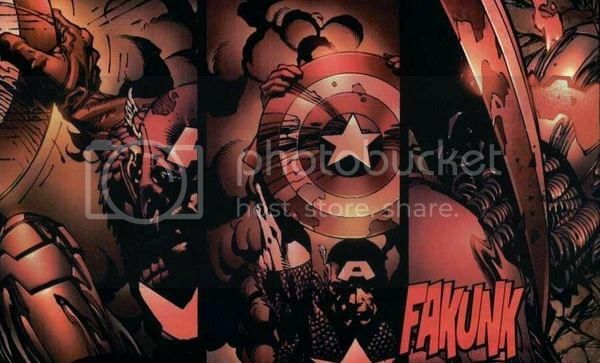 Do you guys have any more scans? Anything from new issues? @cameron83: I'll add these later, but I'll post them here for now. 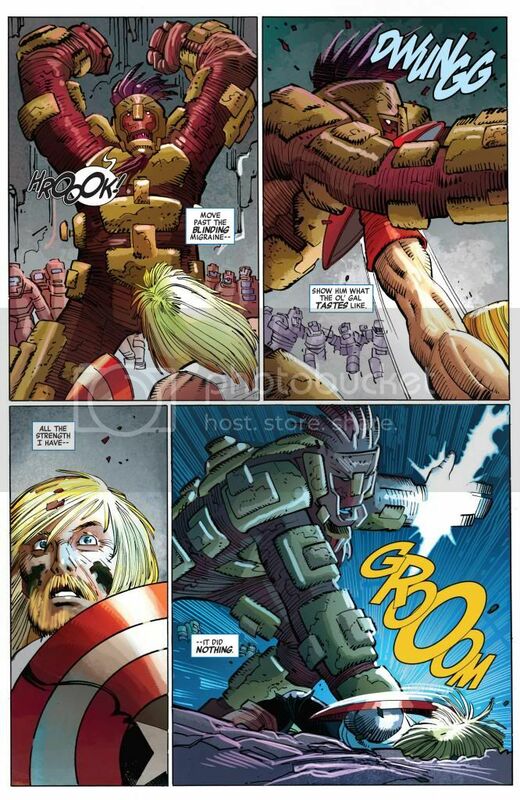 He gets mad and almost kills Nuke. Nuke was amped, he took like 10 red pills, he usually only takes like a few at a time, survived lots of assault rifle hits and a grenade. @krauser99 That sub feat isn't in-continuity, mate. I know it's been a month, but just throwing that out there. 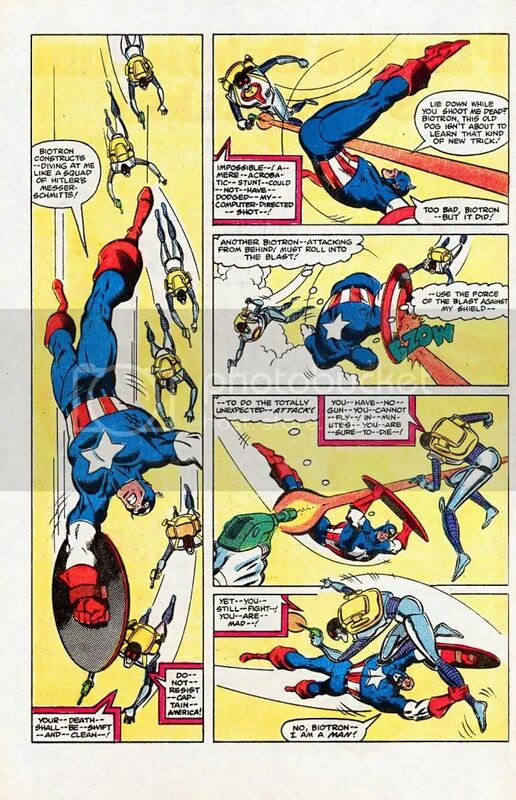 @slimj87d@cameron83 Also, I opt that we actually make a separate category for Cap's Golden Age feats (from the 40s Captain America Comics & the Invaders, et cetera). 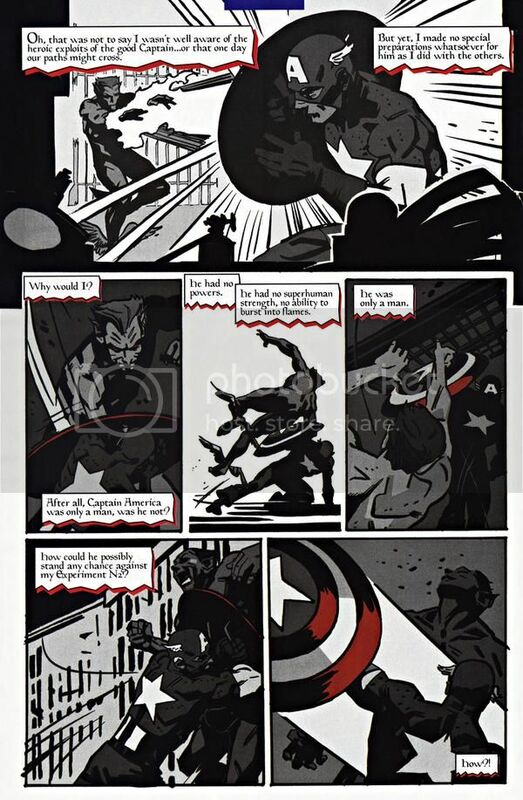 While some of these are impressive, the fact of the matter is that they're loose continuity at best, and weren't written to be reflective of the current, modern understanding of Cap's capabilities. I'm not saying we should discount them entirely, just put them in a separate section of their own. This is just a suggestion on my part, but what do you folks think? 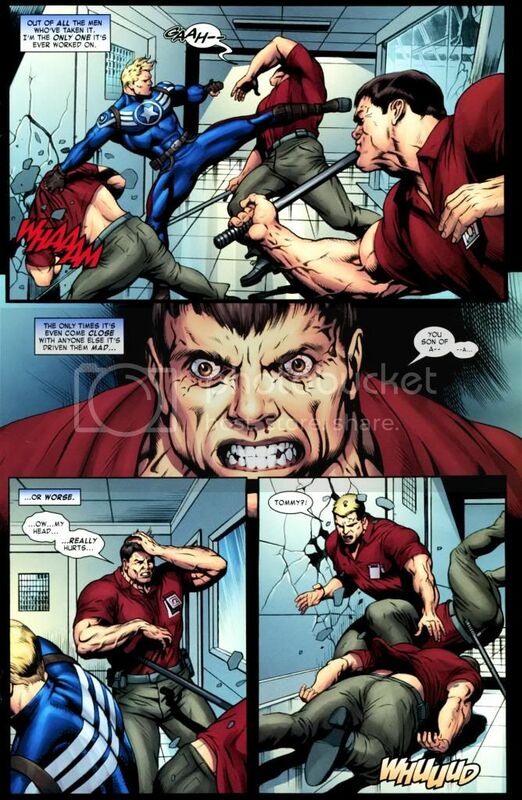 From Daredevil, where Cap knocks out an ordinary guard with a simple tap to the head: I have never seen that. 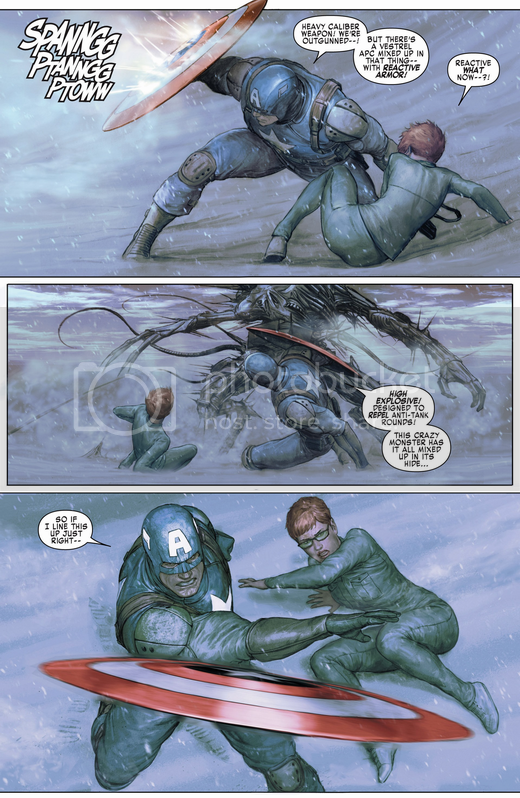 The wiki said that only Ultimate Cap did that,but it's far more impressive that 616 Cap did that. That just raises my impression of his physical abilities! 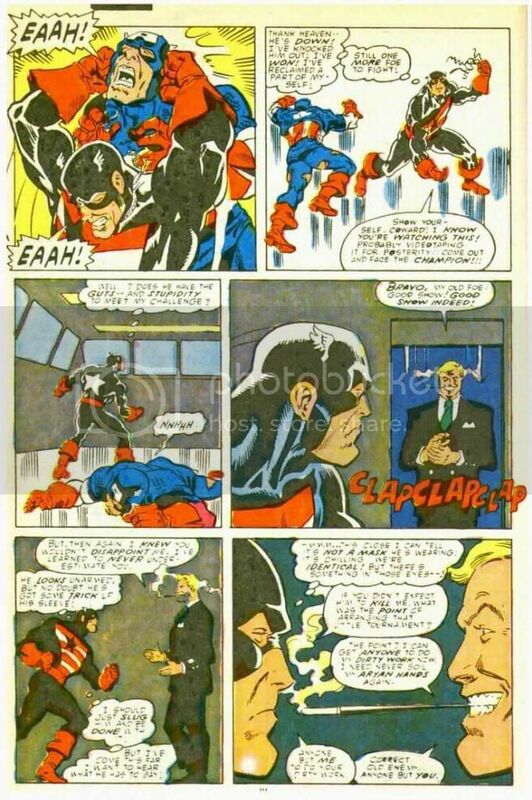 And this one from Chuck Austen's run on Avengers, where Cap was able to (temporarily) one-shot Thunderball for a brief period: That one is interesting. Is it PIS? @cameron83 Regarding the Thunderball feat, it's debatable, but I don't think it's too far-fetched. 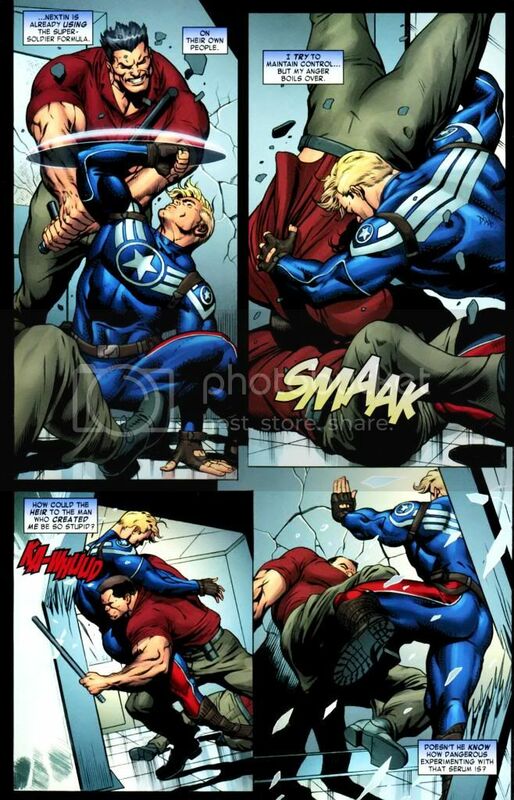 For one, Cap didn't technically knock him out permanently. 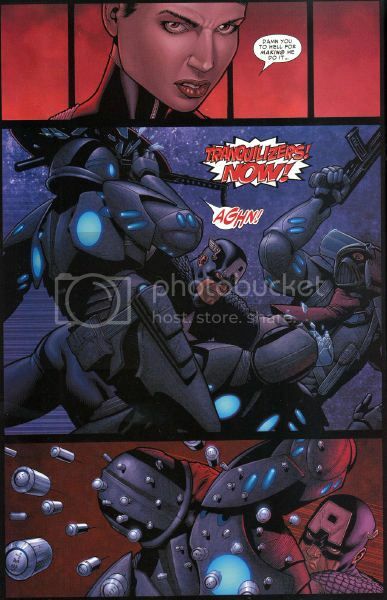 Thunderball was up again in a couple of pages, so it was more like a stunning punch. And it was a sucker punch as well. For another, I don't think Thunderball is that powerful? 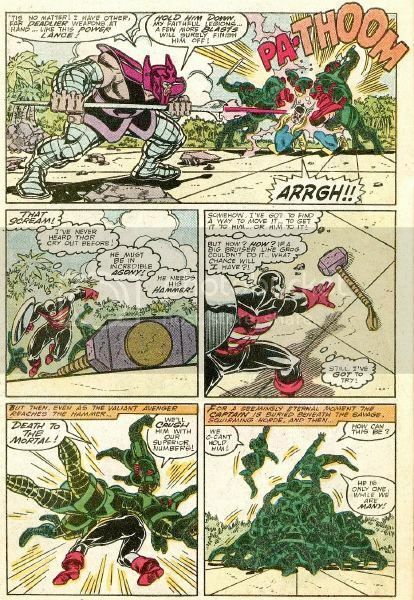 His Classic OHOTMU entry has him at 10 tons only, though I'm not sure if his power-level's increased in recent times. 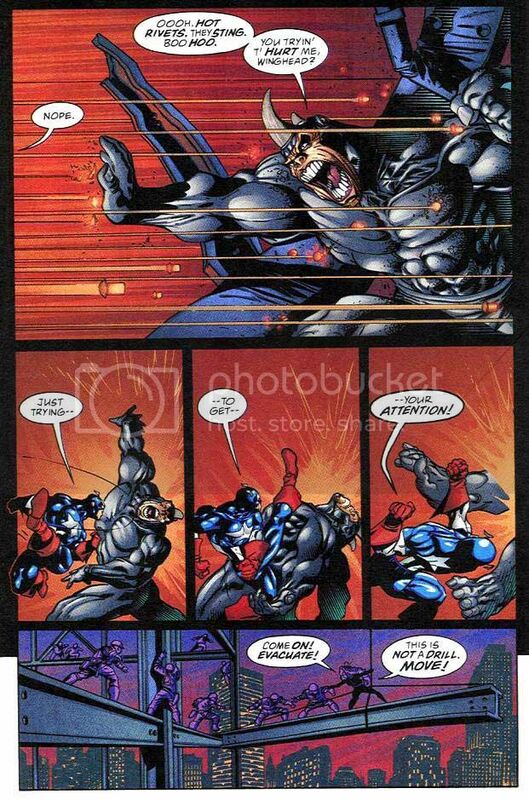 Feats like Spiderman not even coming close to stop the chain ball. 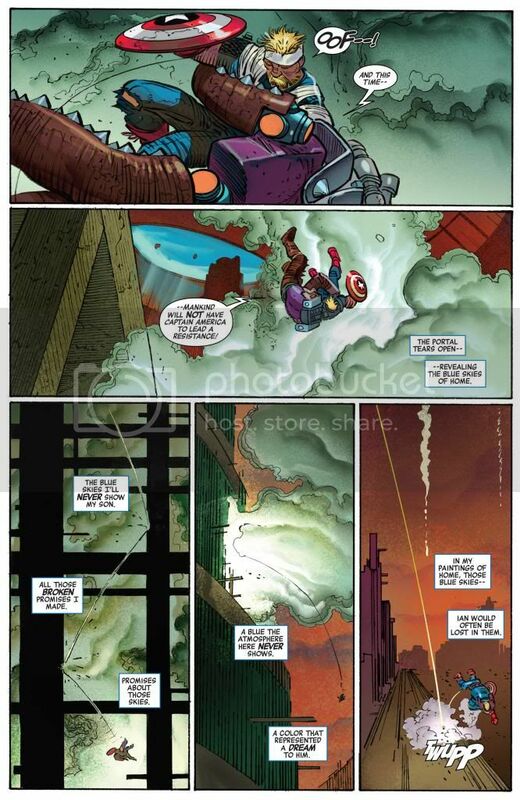 Again restraining Spiderman easily and tossing Spidey like nothing. Thunderball able to hold down Giantwoman briefly at times. Causing small quakes on a city street. 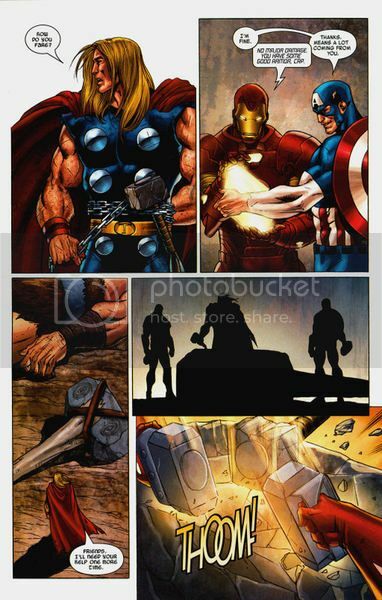 They are much stronger then Spiderman but that may not be power full by your definition if it is in comparison to say like Thor....for sure. Then I agree with your statement. 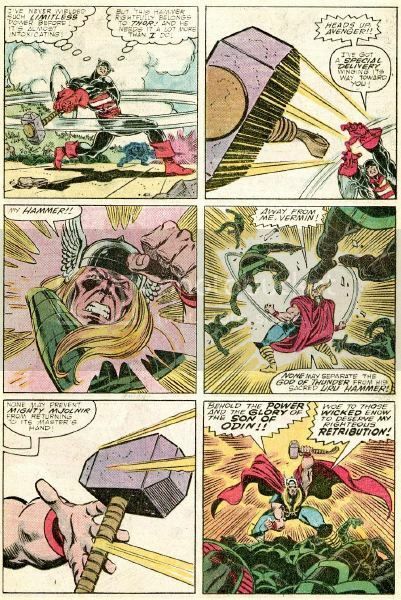 As Thor can defeat them at times pretty easily but they can survive his full on hits. 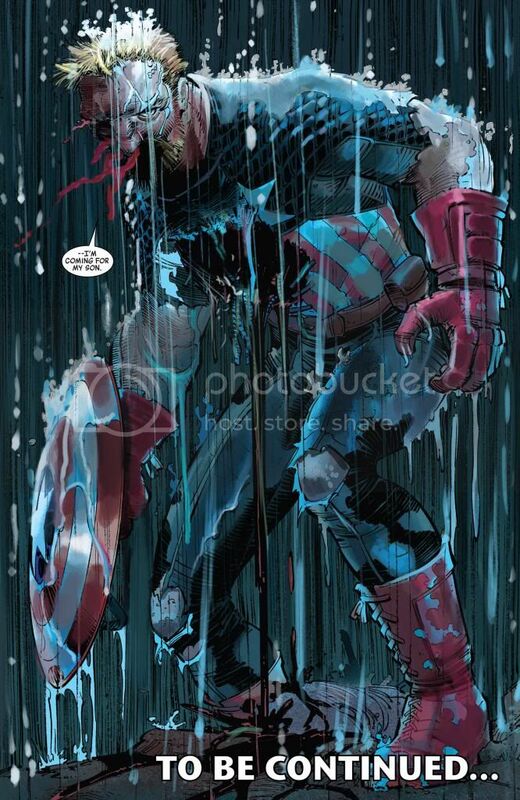 Darn it looks like modern Cap. Hard to tell now a days. Thanks. 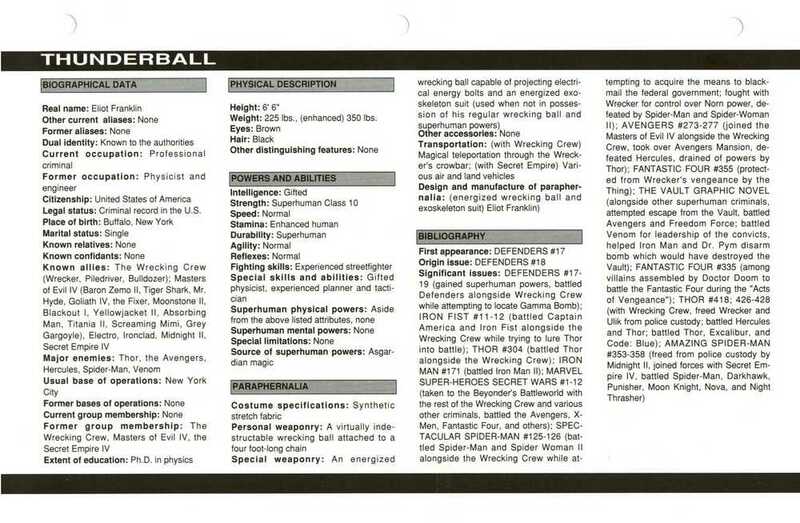 I'm not exactly well-versed in the Wrecking Crew, but like I said, according to Thunderball's entry in the Master Edition of the OHOTMU (from the 90s), he's listed as a 10-tonner. Perhaps on-panel showings are different and depict Thunderball as being stronger, but I was basing my assumption on this entry. It could be wrong. What are your thoughts on it, krauser? 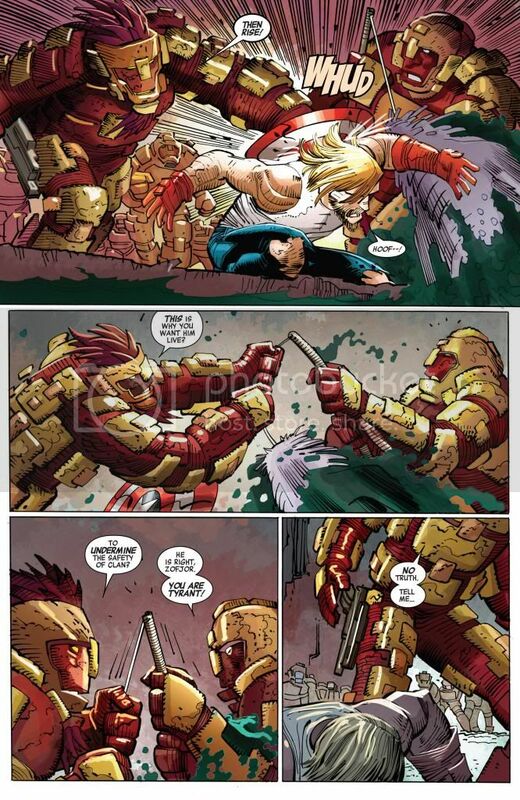 I remember you using this feat in our Ultimate Cap vs. Hulk discussion. 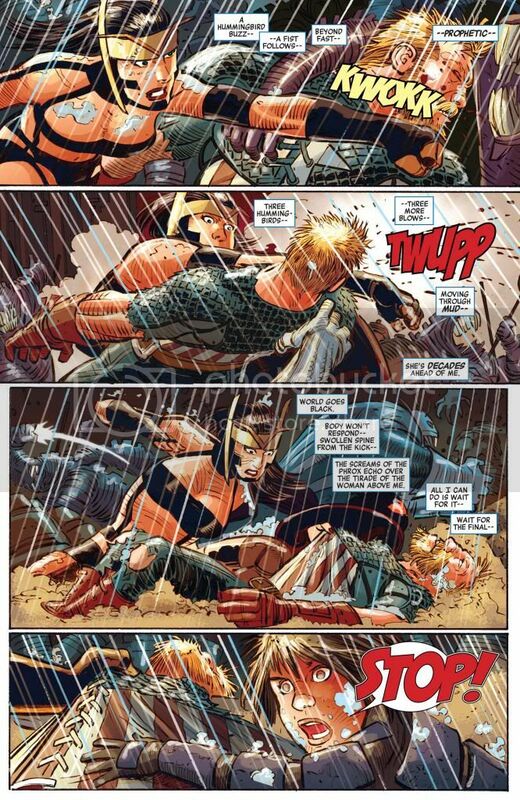 Would you consider it PIS that Cap was able to stun him, particularly as you mention that they can take repeated hits from Thor? No. I wouldn't call it PIS. 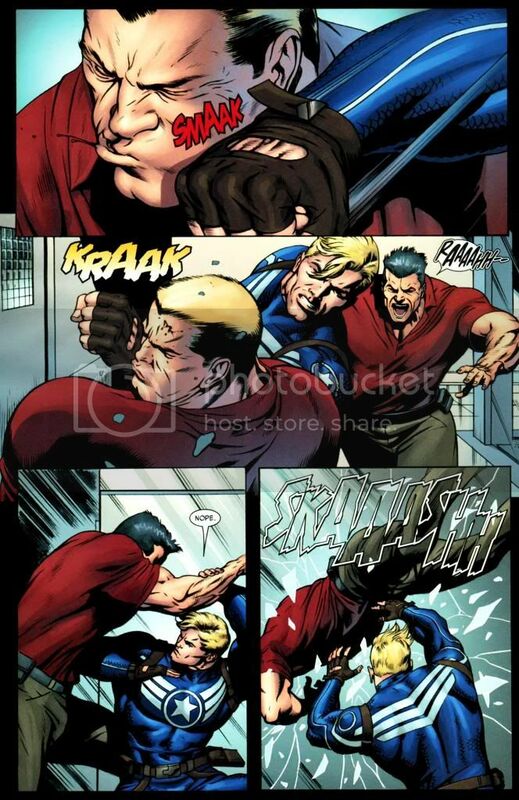 Cap just punches hard and knows how to punch. 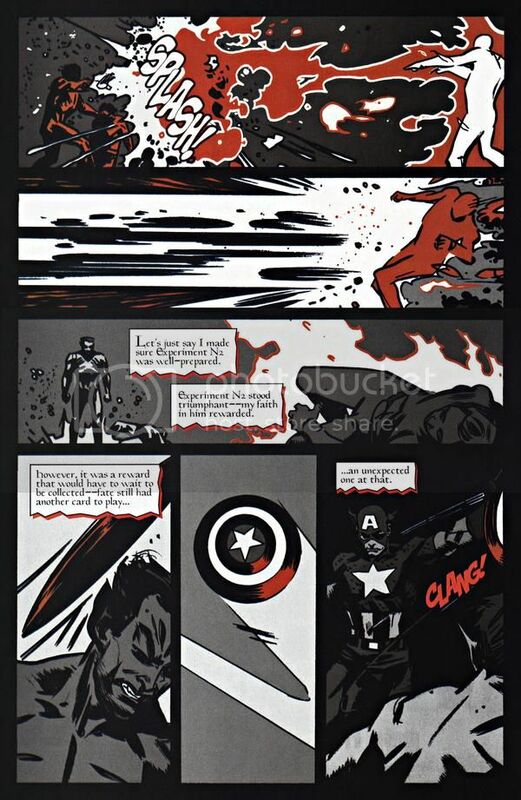 As it's not like he was completely out more like a very brief flash KO as you yourself stated if anything else, but the fact that Cap can make him see stars and bleed is impressive in itself for sure. 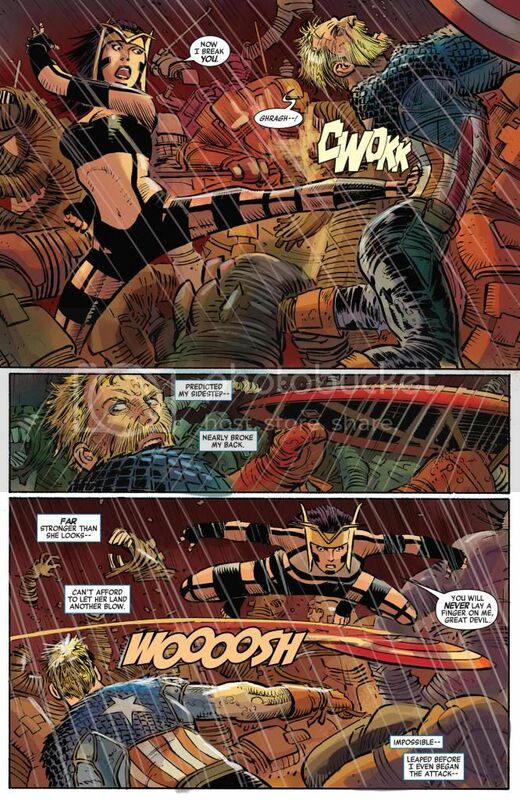 But like I said Thunderball can "survive" Thor strikes but at the same time Thor can take him out easily as well. Even though he can survive them. 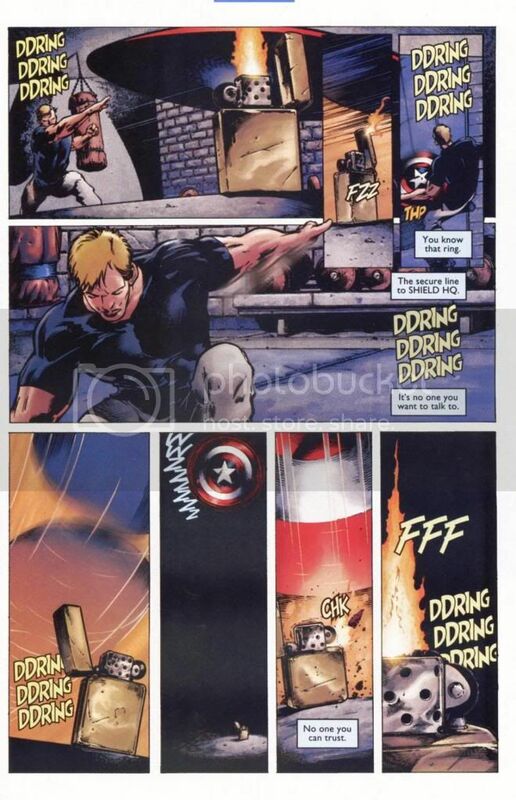 So basically,Cap already has superhuman strength and knows how to apply his strength and where to strike. 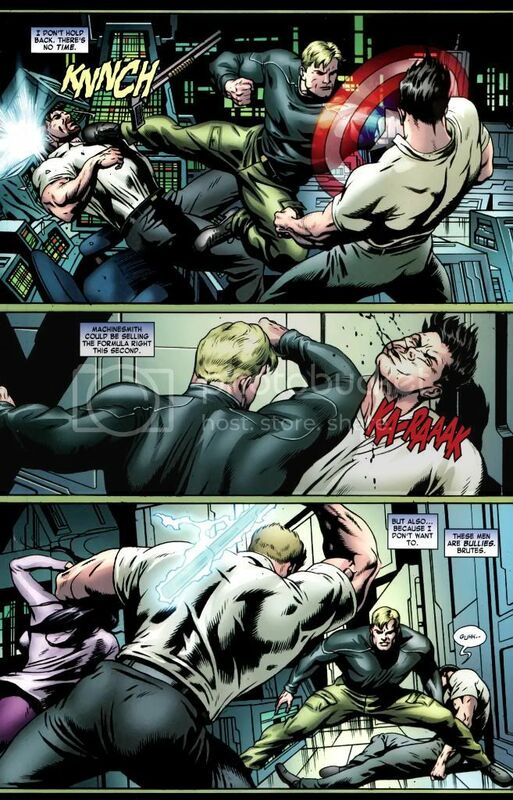 Just like Midnighter isn't stronger than Apollo or anywhere near his strength,yet he can still hurt him. 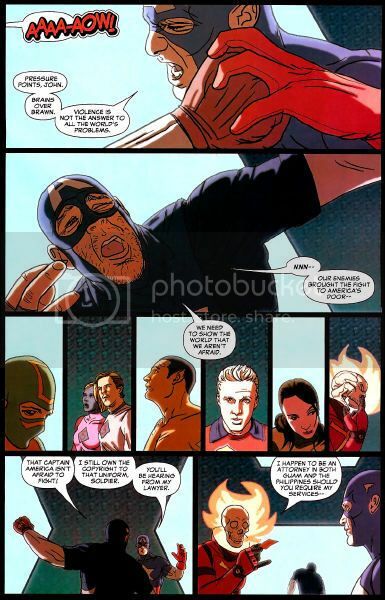 I mean,Cap's hurt people that are out of Thunderball's league like Hulk on multiple occasions,Namor (on multiple occasions),Iron Man (multiple times),etc. 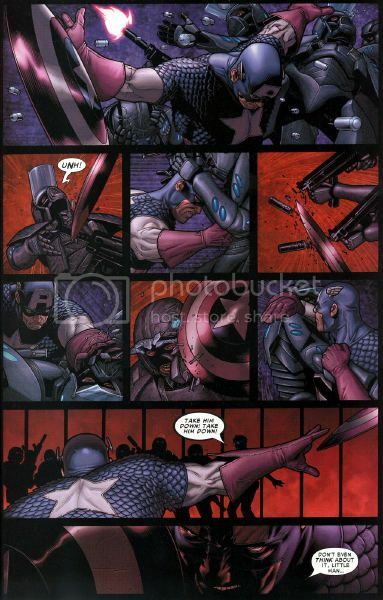 However,Cap only knocked him out briefly,and Thunderball came back,right? 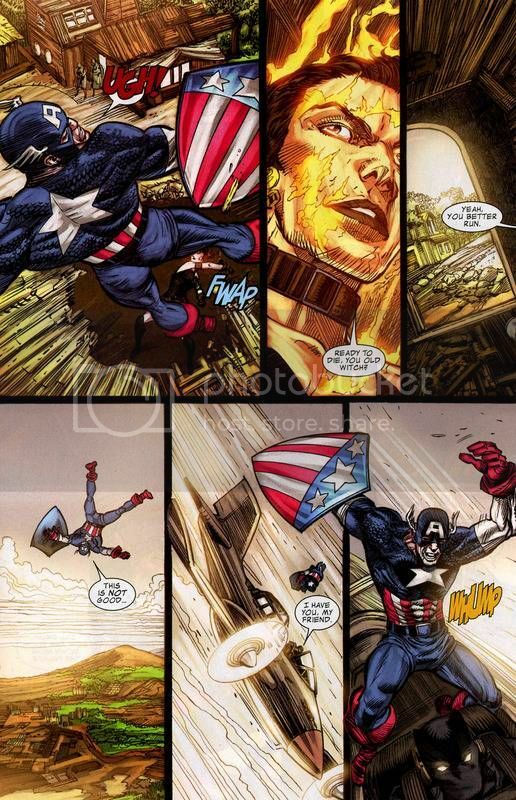 Some feats from current Cap. He mentions he is immune to "radiation". In the past Cap has feats of being also show immune to alcohol poison, poisons in general, an alien virus. 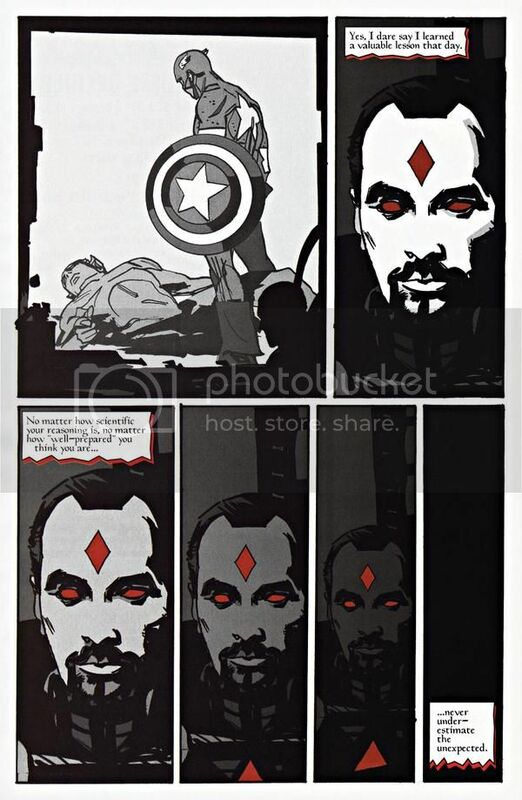 And in volume 3 just before he fought Protocide Steve survived in a nuclear containment unit for those who remember. 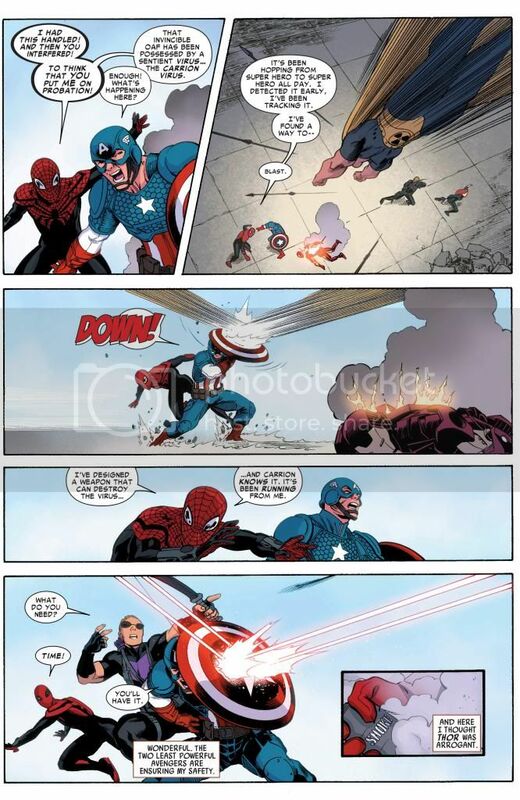 Takes a punch from a angry Spiderman. 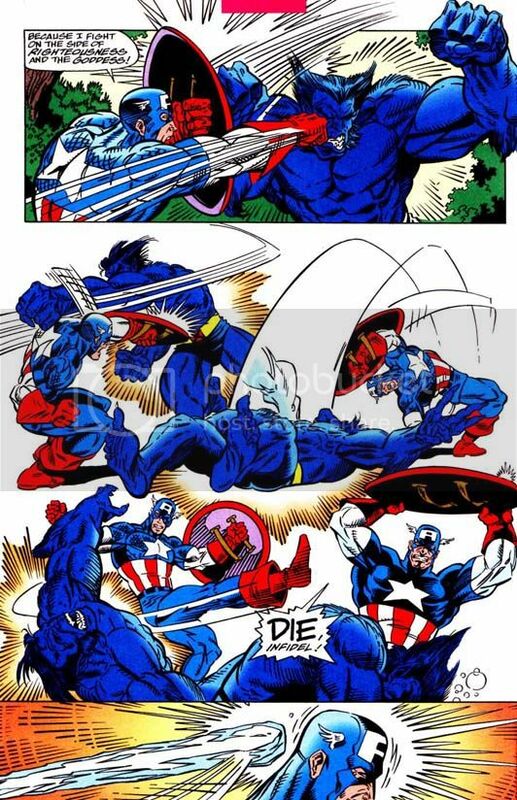 Cap fights briefly Blade. 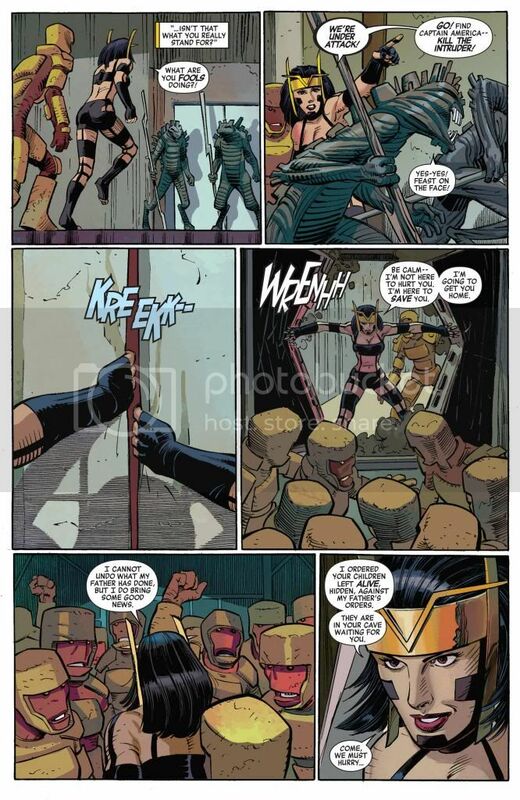 Context I was told Blade is mind controlled. But he does appear to know how to use his abilities like turn into a bat or bite. 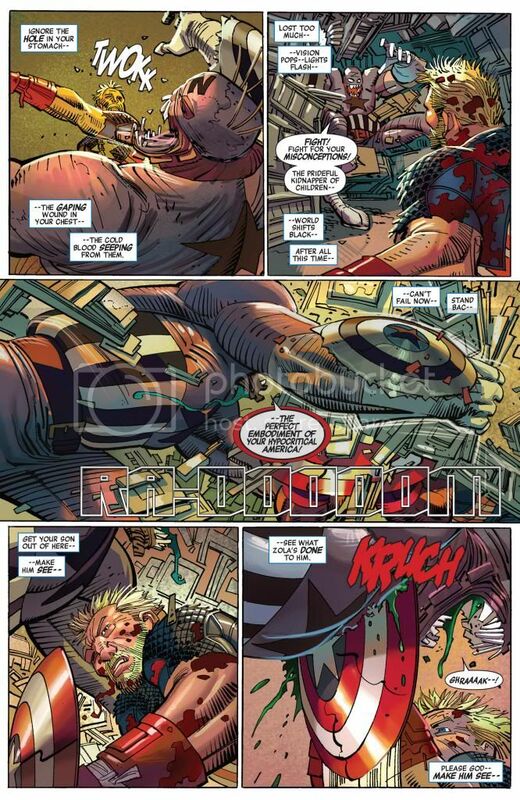 @slimj87d Did anything new happen in the recent Captain America story? What happened to Steve? In the Order. Cool durability feat. 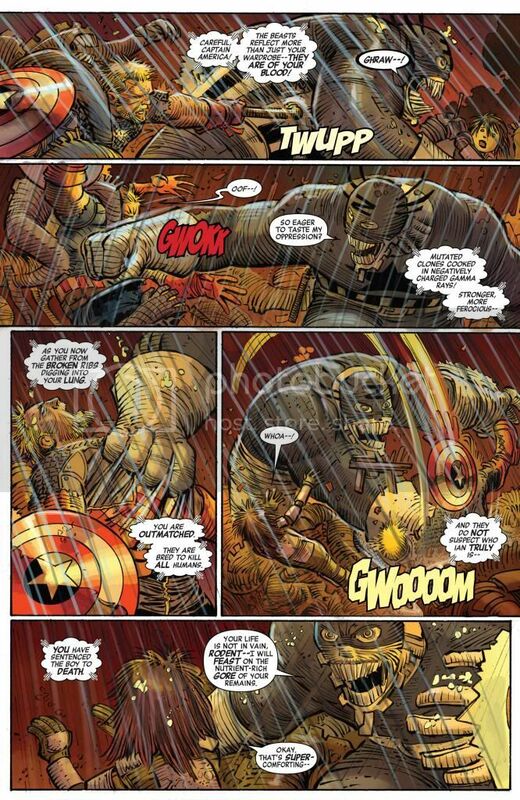 Gray Hulk does a shock wave that hurts Ironmanhimself along with Captain America. 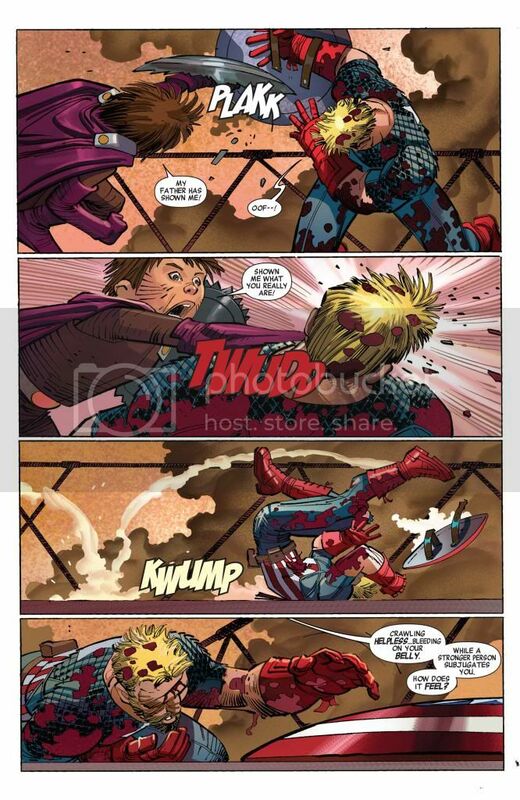 Yet our Super Soldier is still up and fighting along with Ironman..
@slimj87d: Nicely done and all, but my problem with this feat: http://s1204.photobucket.com/user/raykongs/media/CapshattersExtremis_zps1d1faba0.jpg.html, is that there's missing context behind it. 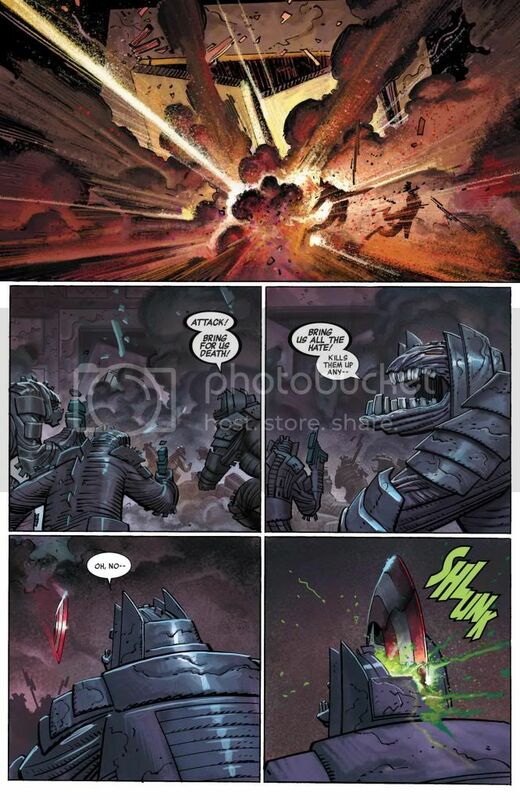 Irom Man's armor was weakend due to Vision messing it up the page before. 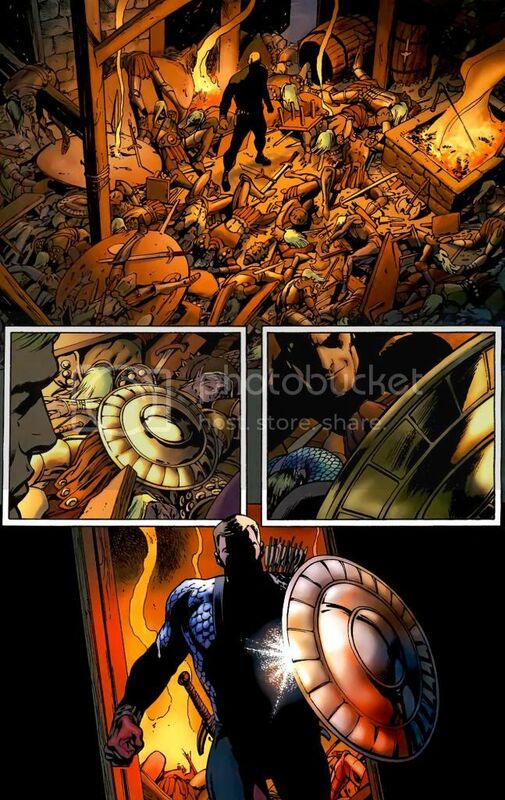 The Extremis armor works based on Tony's thought, right? Vision weakend Tony, so this feat isn't very impressive. Late response, but I figured why not. I think you might be misreading the feat's context. 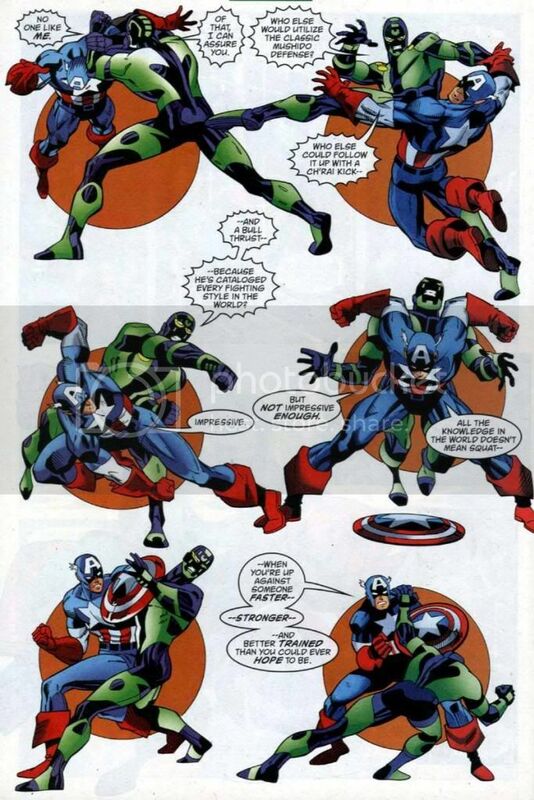 Vision's powers turned the suit off, but it didn't affect the durability of the actual armor itself. 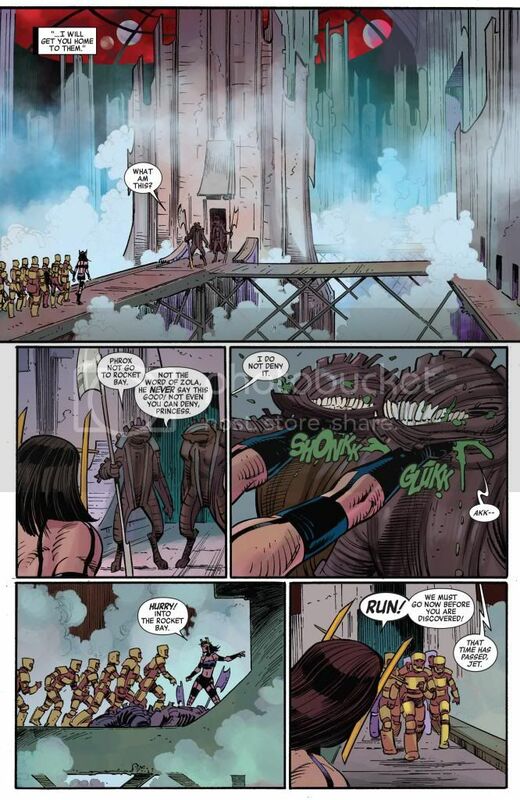 @veshark: Isn't the Extremis armour supposed to run on Tony's thoughts? Which means that the suit was weakend? 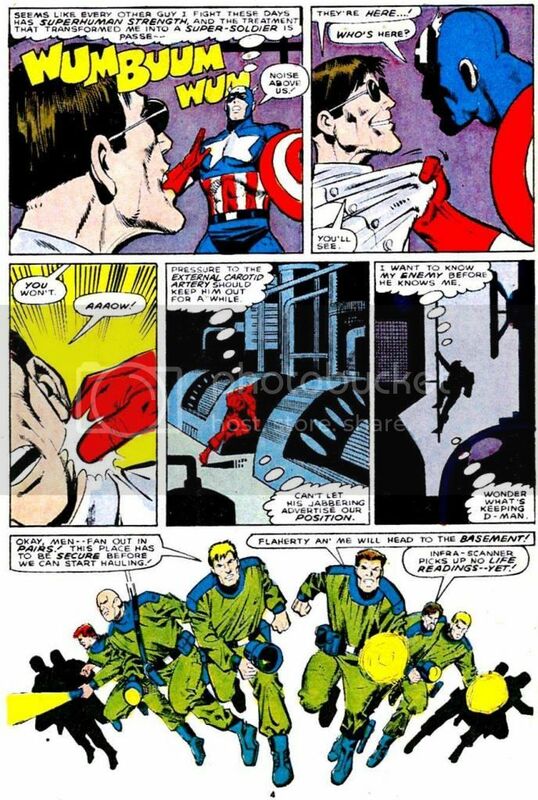 The actual durability/constitution of the physical armor itself doesn't get stronger or weaker based on Tony's thoughts. 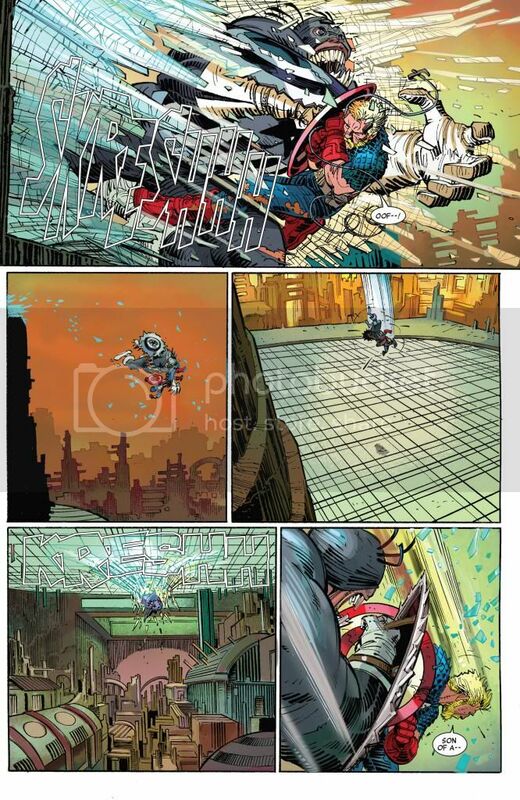 @veshark: Can I get a scan or something of an illustration that confirms that. 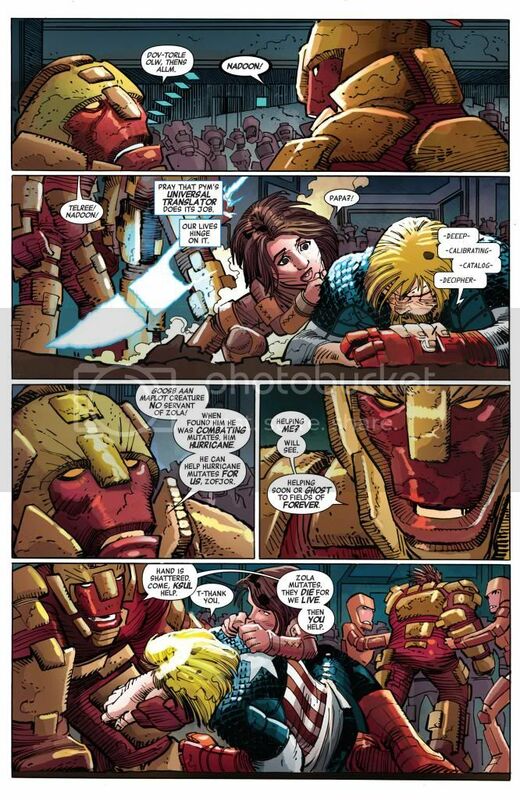 I've seen that the power of the Extremis armour mainly comes from Tony's mind which is why I thought that. Specially since it's a part of his body. 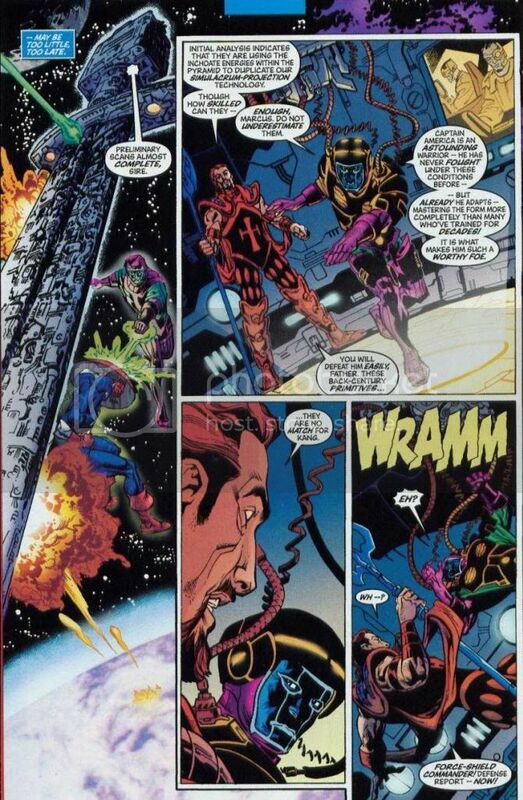 I thought of the Extremis armour as a Green Lantern ring. If a Green Lantern's mind (will, actually, but saying mind to get the comparison) isn't strong enough, the constructs will not be strong. See what I mean? One scan confirming it, if you don't mind.